Saturday 31st October 2015 – 7.30pm – Jamie Arrowsmith. 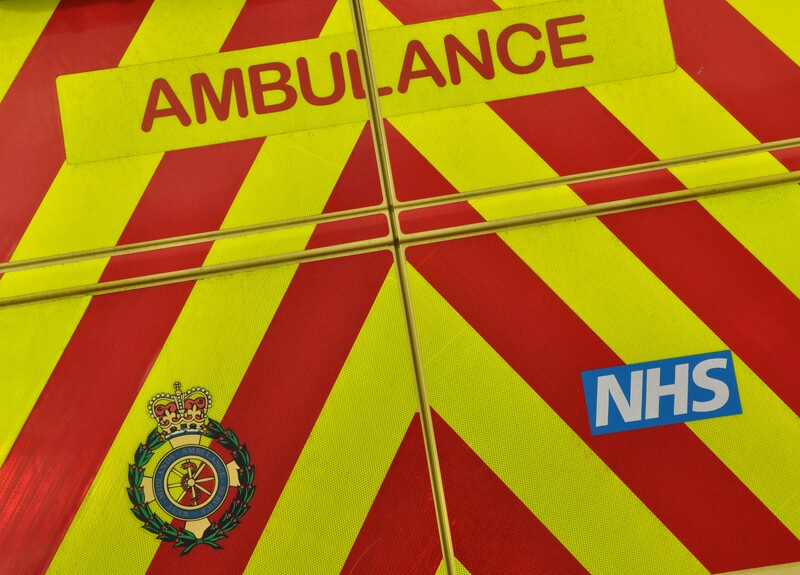 A woman has suffered a serious head injury and been anaesthetised following a collision with a car this evening. 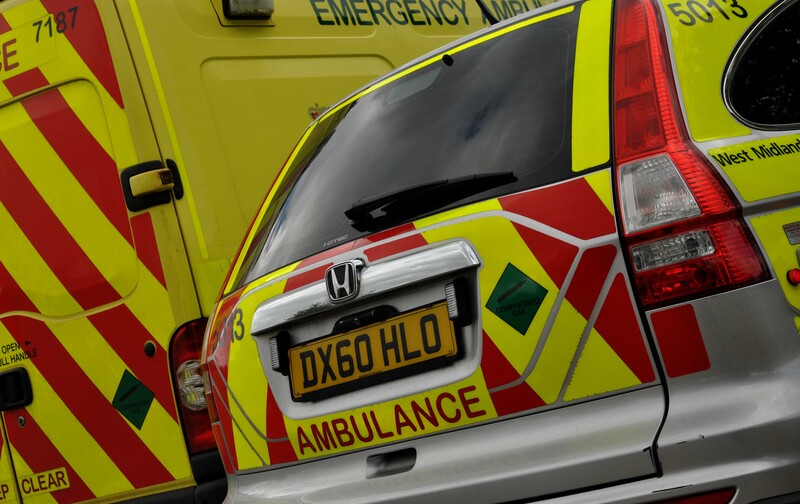 The collision resulted in the car windscreen suffering significant damage and following treatment, the woman was taken to a major trauma centre with injuries which, unfortunately, are thought to be extremely serious. West Midlands Ambulance Service was called to New Road in Uttoxeter, shortly after 5.30pm and sent an ambulance, a rapid response paramedic, a paramedic area support officer and a doctor to the scene. The crews of the Midlands Air Ambulances from Staffordshire and Cosford also attended the scene in rapid response vehicles. A West Midlands Ambulance Service spokesman said: “Crews arrived to find a woman, believed to be in her 60s, with a reduced level of consciousness following a collision with a car. “Ambulance staff quickly began giving treatment for a serious head injury as well as chest and ankle injuries. “In order to stabilise her condition she was anaesthetised at the scene before being transported to Royal Stoke University Hospital. The doctor travelled on the back of the ambulance to continue treatment en-route. Saturday 31st October 2015 – 7am – Jamie Arrowsmith. 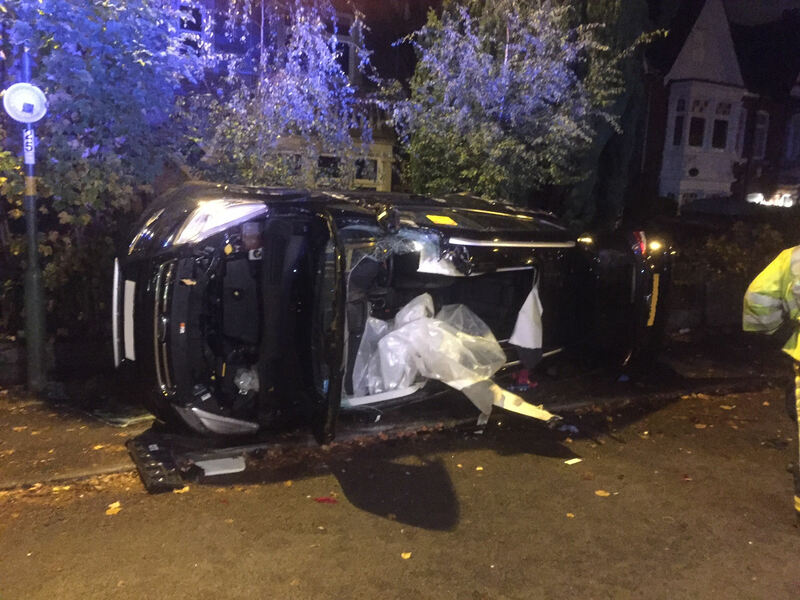 Two separate RTCs in Walsall overnight saw two cars overturn and six people injured within the space of 35 minutes. The first crash saw a car collide with a number of stationary vehicles before overturning and coming to rest on its roof. It happened on Bloxwich Road at 12.15am and West Midlands Ambulance Service sent three ambulances, a paramedic area support officer and the MERIT trauma doctor to the scene. A West Midlands Ambulance Service spokesman said: “Crews were told that the car collided with three stationary vehicles before rolling over. “The driver of the car, a man in his 30s, had to be helped out of the vehicle and was treated for a suspected head injury and cuts to his arm. “He was immobilised with the use of a neck collar and spinal board and taken to Walsall Manor Hospital. “There were two further patients, a man who was sitting in one of the stationary vehicle and a woman who was just about to get in to the passenger seat. “The man, thought to be in his 40s, was treated for neck, leg and chest injuries whilst the woman, believed to be in her 20s, suffered abdominal, neck and back injuries. The second incident happened on Pleck Road, near to the Bradford Arms Public House, shortly before 12.50am and saw a car collide with a tree and roll over. West Midlands Ambulance Service sent three ambulances, a paramedic area support officer and the MERIT trauma doctor to the scene. A West Midlands Ambulance Service spokesman said: “There were three patients from the vehicle, all men in their 20s. “The most seriously injured was the front seat passenger who had to be cut free through the roof. “He was treated for leg and pelvic injuries, immobilised and taken to Queen Elizabeth Hospital, Birmingham. The doctor travelled on the back of the ambulance to continue treatment en-route. Friday 30th October 2015 – 3.30pm – Claire Brown. These are the words one of our Birmingham-based paramedics heard this week when he was reunited with a patient who was seriously injured in an RTC earlier this year. Joel Fowler (18) from Solihull was driving his car with two friends as passengers in the early hours of Sunday 8th March when it collided with a tree in Haslucks Green Road in Shirley. Paramedic Cameron McVittie was first on scene from the ambulance service and found Joel unconscious, seriously injured and trapped in the car. Joel had to be sedated at the scene due to his condition before being rushed to Queen Elizabeth Hospital Birmingham. His two friends escaped without serious injury. Joel was in hospital for 17 days and in a medically induced coma for the first week. He sustained a fractured skull and eye socket, a subdural haematoma, a laceration to his liver, a collapsed lung and facial nerve damage but is well on the way to recovery. 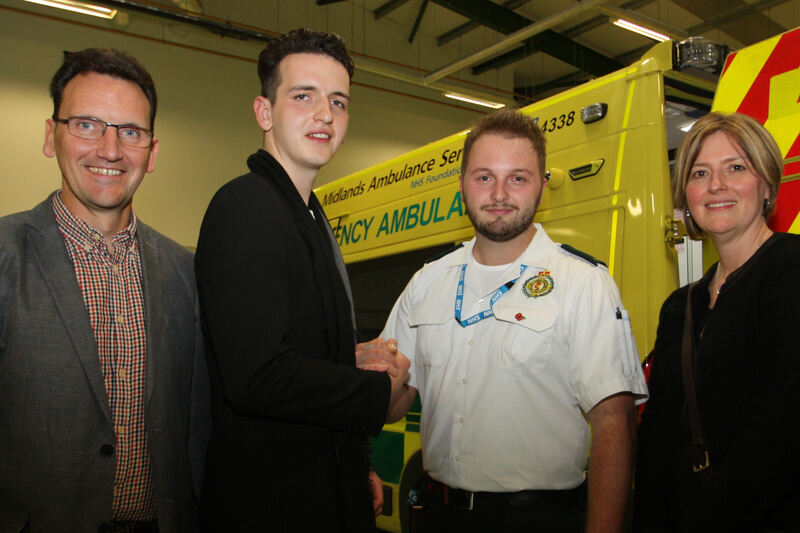 On Tuesday (27th October) Joel and his parents visited Erdington ambulance hub to meet Cameron. 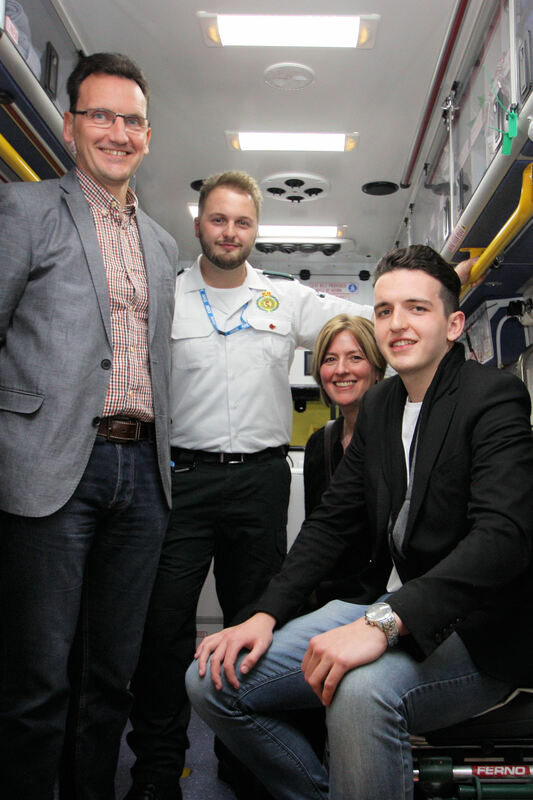 Reunion at Erdington hub with Joel, his mum and dad and paramedic Cameron. There are no photographs of the RTC. Thursday 29th October 2015 – 10am – Jamie Arrowsmith. Mix together a sprinkling of Halloween, a pinch of pay day weekend and the darkening nights and the result is an extremely busy few days ahead for the ambulance service. In order to ensure everyone enjoys a safe and spooky Halloween weekend, West Midlands Ambulance Service is urging everyone to take extra care of themselves, as well as keeping an eye out for others whilst enjoying the ghostly goings on. With Halloween falling on Saturday, large numbers of parties are expected to take place as well as plenty of youngsters heading out ‘trick or treating’. Wherever you are heading, please make sure you wear something bright to ensure you are visible to car drivers or carry a torch or glow stick. We would also encourage all parents to accompany their little terrors as they creep around the neighbourhood and be aware who they scare. The Trust also urges motorists to take care when driving and be aware that there could be many more pedestrians out and about in the dark than previously, throughout the course of the next few months, not just this weekend. Similarly, cyclists should also make sure they can be seen and have bright and reflective clothing and working lights. WMAS Emergency Services Director, Craig Cooke, said: “First and foremost we want everyone to have fun this weekend. “But we also want everyone to enjoy themselves safely which is where you can help yourselves, others and us. 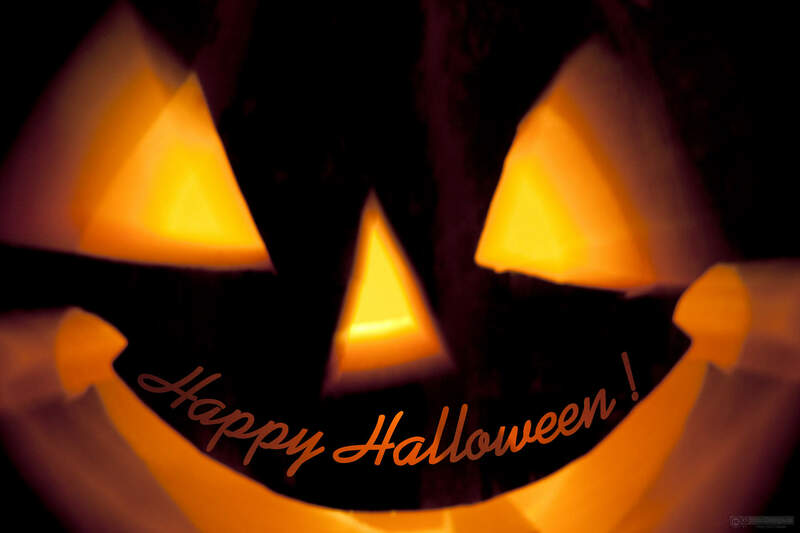 “Be more aware if you are driving and if you are going trick or treating or heading to a Halloween party, make sure you are not alone and can clearly be seen by others. “Looking after yourself is one thing but we would also urge you to look out for others over the weekend. In turn this will hopefully ensure we are kept free to attend those real life threatening emergencies. “We will have a lot of extra resources on the roads throughout the region as well as extra manager cover all weekend to ensure we maintain the highest level of patient care. Thursday 29th October 2015 – 6.45am – John Hawker. 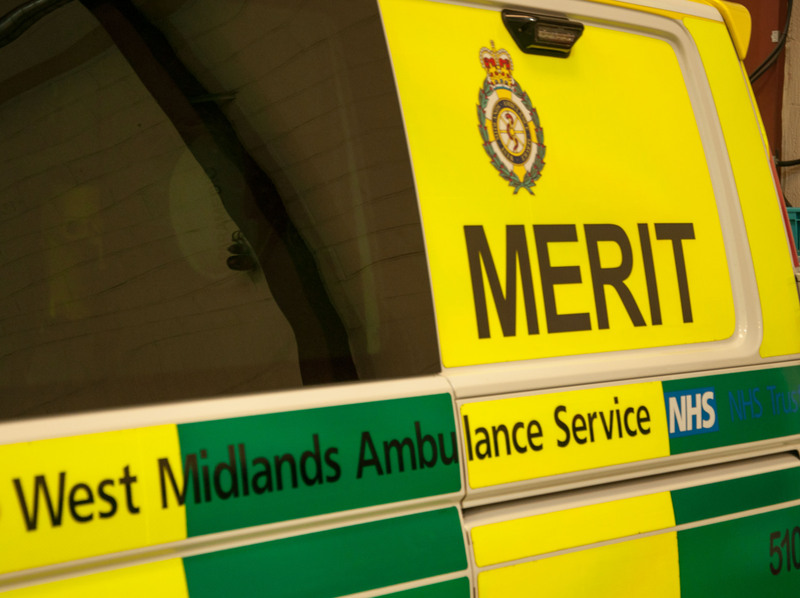 A motorcyclist has received trauma care from medics at the scene of an RTC in the Black Country last night. The crash occurred on Springfield Avenue, Wollescote at around 9.10pm. A rapid response vehicle, an ambulance, a paramedic officer and the Trusts MERIT Team attended the scene. 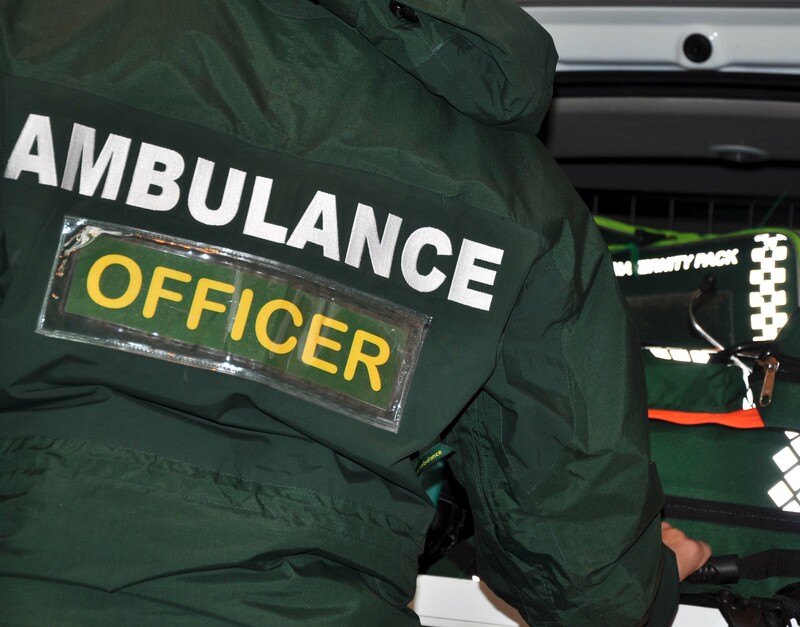 A West Midlands Ambulance Service spokesman said: “The man riding the motorcycle had been thrown from his machine after being in a significant collision with a car. Both vehicles had suffered substantial damage. “The man, believed to be in his 50’s, suffered multiple injuries to his chest, legs and upper body. He received trauma care at the scene by medics and his condition was stabilised. “Following treatment, the man was transferred by land ambulance to Queen Elizabeth Hospital Major Trauma Unit for further assessment and treatment. The MERIT Trauma Team travelled on board the ambulance continuing with treatment on route to hospital. “The hospital had been pre alerted to the man’s arrival and his injuries. Thursday 29th October 2015 – 6.15am – John Hawker. 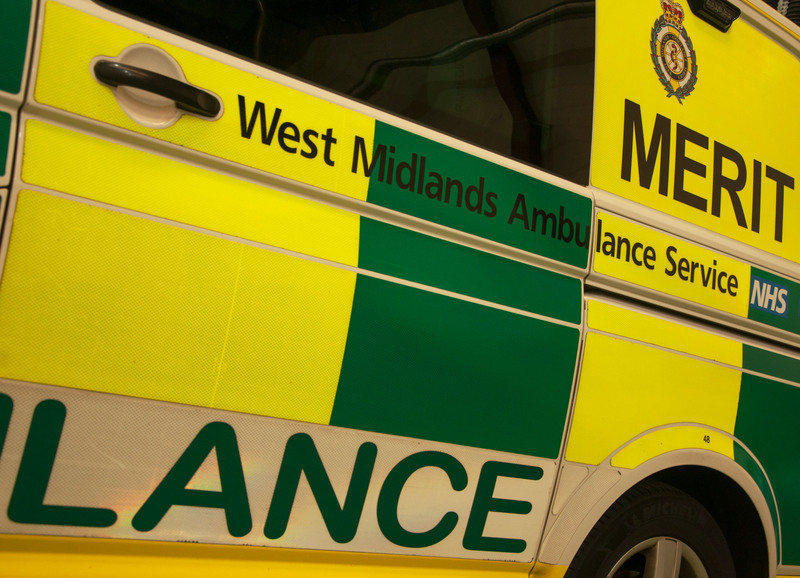 A pedestrian has died following an RTC on the outskirts of Birmingham last night. The incident occurred on the Hagley Road West, Quinton at around 8.20pm. A West Midlands Ambulance Service spokesman said: “Crews arrived to find a pedestrian in traumatic cardiac arrest after being in collision with a car. 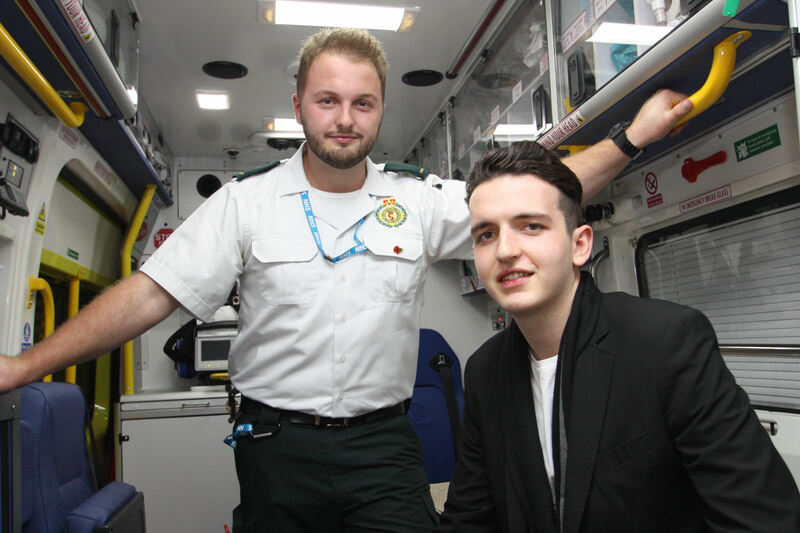 “An off duty paramedic and doctor were carrying out CPR on the man and ambulance medics continued resuscitation attempts using advanced life support techniques. “Unfortunately, despite everyone’s best efforts, nothing could be done to save the man and he was confirmed dead at the scene. “No other person was injured in the incident. Thursday 29th October 2015 – 6.00am – John Hawker. 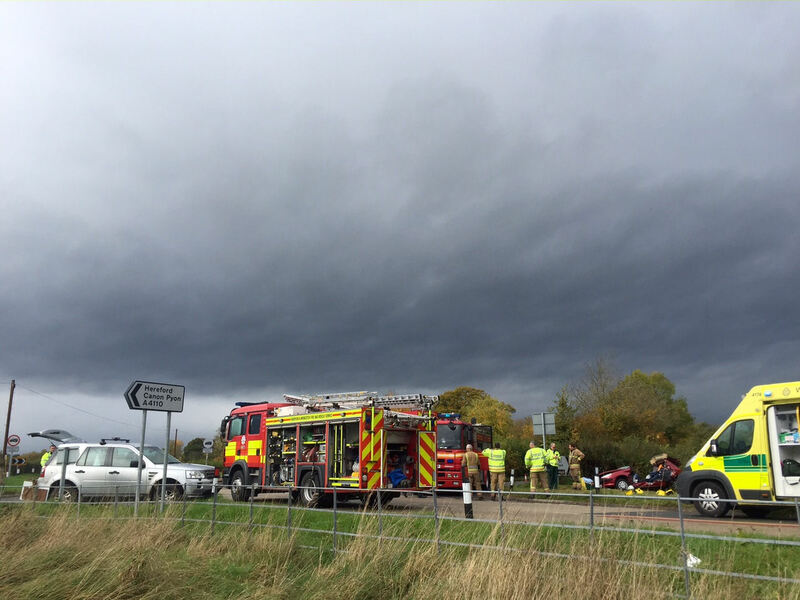 A motorcycle scooter rider has died following an RTC in Warwickshire yesterday afternoon. The incident occurred on the A46, Alcester, towards Bidford at around 4.50pm. A rapid response vehicle, an ambulance, a paramedic officer and the Midlands Air Ambulance from Strensham attended the scene. A West Midlands Ambulance Service spokesman said: “Crews arrived to find a car and a scooter that had been in a serious collision. “The woman riding the scooter had suffered multiple serious injuries and was in traumatic cardiac arrest. “Resuscitation attempts were carried out at the scene by medics including advanced life support techniques. “Unfortunately, despite everyone’s best efforts, nothing could be done to save the woman and sadly she was confirmed dead at the scene. Wednesday 28th October 2015 – 12.30pm – Jamie Arrowsmith. A local charity has taken delivery of lifesaving machines that can restart a person’s heart following a cardiac arrest. Acorns Children’s Hospice is to house three Automated External Defibrillators (AEDs) at its three sites; Acorns in Birmingham, Selly Oak, Acorns for the Three Counties in Worcester and Acorns for the Black Country in Walsall. 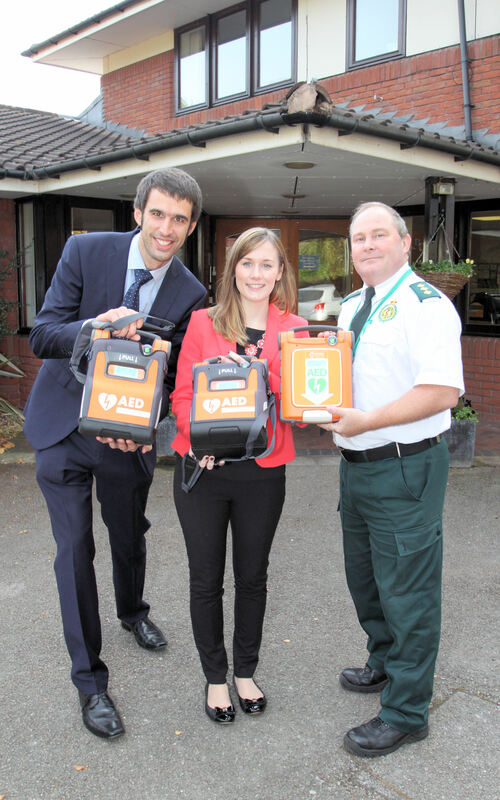 The AEDs will be used in the emergency resuscitation of adults experiencing a cardiac arrest. Two of the machines have been donated by support services and construction company Carillion, the other by West Midlands Ambulance Service who will also be offering free training in how to use them to Acorns’ staff and volunteers. There are an estimated 60,000 out-of-hospital cardiac arrests in the UK each year. The chance of a person surviving a cardiac arrest falls by 10 per cent for every minute that passes without an AED being used. Survival rates can be as high as 75 per cent when patients are treated with the right care and a defibrillator in time. WMAS Community Response Manager Andy Jeynes said: “It was a fantastic co-incidence that Carillion contacted me to ask whether we had a use for two defibrillators as it came just a few days after Ben McFadzean, an Acorns volunteer, had asked about the possibility of getting some defibs at their three sites. Chris Reed, Head of Care at Acorns in Birmingham, said: “We have lots of people come to Acorns, either visiting children, coming to our Garden Fete or Open Garden events, as well as our many members of staff and volunteers. Rob Yates, Senior Quantity Surveyor for Carillion, said: “Carillion has a strong focus on involvement in the local community. “Together with colleagues Mike Tourt and Dan Albanese, I work on projects in Birmingham and when we were given the defibrillators in recognition of a health promotion campaign we organised; donating them to a good cause local to our current project was our top priority. Ben McFadzean, who is also a Crew Manager at Birmingham Airport Fire and Rescue, said: “I started volunteering with Acorns this year and after attending a first aid course with them I was aware that they did not have AEDs at their sites. Acorns provides a network of specialist palliative nursing care and support to babies, children and youngsters aged up to 18 who have life-limiting or life-threatening conditions and associated complex needs. 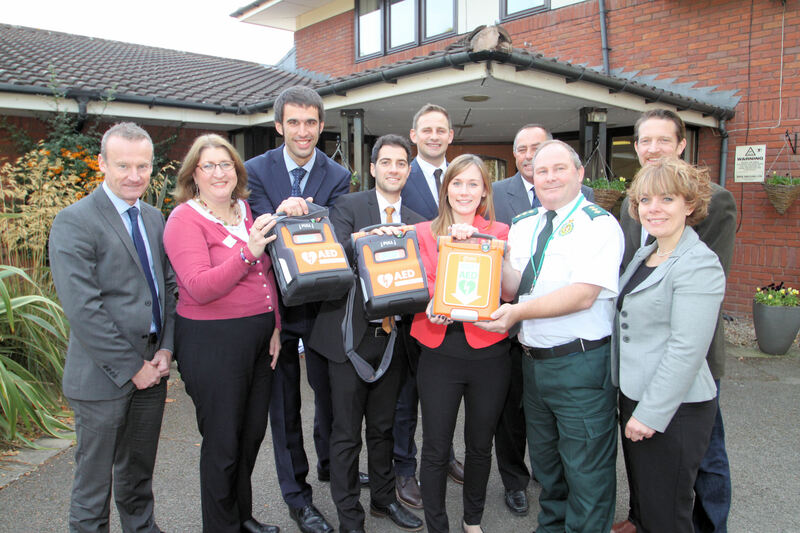 Top picture: (l-r) Rob Yates (Carillion), Charlotte Anson (Acorns) and Andy Jeynes (West Midlands Ambulance Service). Bottom picture: (l-r) Paul Reynolds (Carillion), Wendy Mitchell (Carillion), Rob Yates (Carillion), Dan Albanese (Carillion), Michael Tourt (Carillion), Charlotte Anson (Acorns), Neil Boon (Carillion), Andy Jeynes (West Midlands Ambulance Service), Ben McFadzean (Acorns & Birmingham Airport Fire and Rescue) and Louise Arnold (Acorns). Tuesday 27th October 2015 – 8.30pm – Chris Kowalik. A properly fitted childseat meant a two-year old boy was uninjured when the car he was in collided with another. The crash happened at the junction of Leegate Avenue and Chichester Drive in Leegomery. West Midlands Ambulance Service was called at 4.40pm and sent three ambulance crews and a paramedic area support officer in a rapid response vehicle. With darkness falling, the crew of the Midlands Air Ambulance from Cosford consisting of a trauma doctor and critical care practitioner attended by rapid response vehicle. A West Midlands Ambulance Service spokesman said: “The boy who was in the back of the car was securely wrapped up in the childseat which prevented any injury to him despite the significant damage done to both cars by the crash. 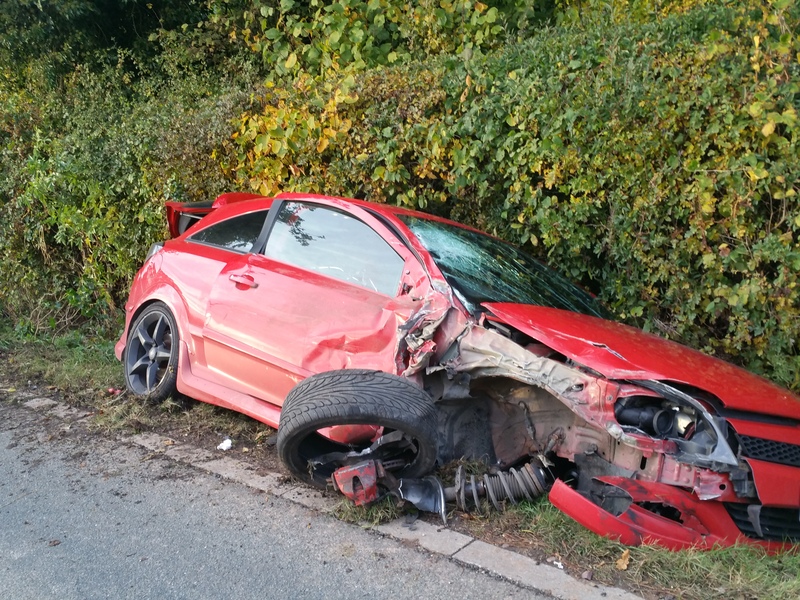 The driver of this car, a woman in her forties had a minor seatbelt injury and was immobilised with the use of a spinal board and neck collar as a precaution before being taken to Royal Shrewsbury Hospital. Tuesday 27th October 2015 – 1.10pm – Chris Kowalik. There were no serious injuries after a crash on the M5 in Worcestershire that saw a lorry leave the motorway and go down an embankment. West Midlands Ambulance Service was called to the southbound carriageway between junctions 5 and 6 shortly before 9.15am today. Two rapid response vehicles driven by a paramedic and a paramedic area support officer attended along with two ambulance crews and the Hazardous Area Response team. A West Midlands Ambulance Service spokesman said: “The lorry driver, a man in his fifties, was freed from his cab with the help of the fire service. He was checked over at the scene and due to his condition, he was taken to Worcestershire Royal Hospital for further assessment. Monday 26th October 2015 – 5.25pm – John Hawker. 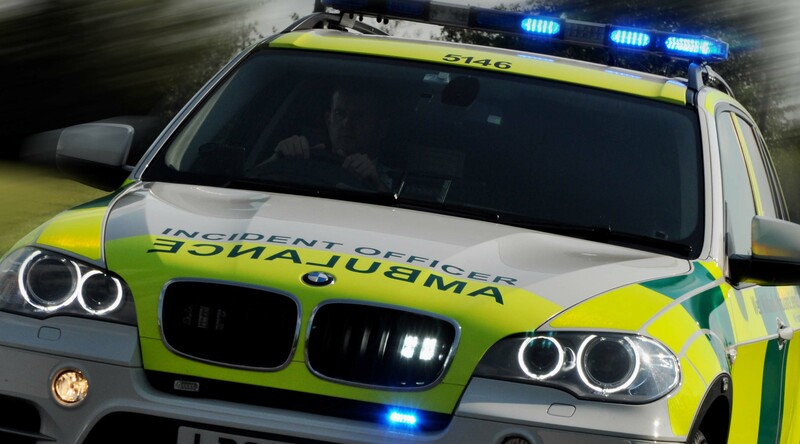 A motorcyclist has been seriously injured following an RTC in Solihull this afternoon. The incident occurred at the junction of Castle Lane and Summerfield Road, Olton, at around 3.30pm. A West Midlands Ambulance Service spokesman said: “Crews arrived to find a motorcycle that is believed to have been in collision with two cars. “One man who is believed to have been the pillion passenger when the crash occurred suffered a serious head injury and received emergency treatment at the scene. “Once his condition was stabilised, the man who was in his 20’s, was transferred by land ambulance to Queen Elizabeth Hospital major trauma unit for further treatment. “The rider of the motorcycle was not found at the scene when ambulance crews arrived. Two ambulances, a paramedic officer and a BASICS Doctor attended the scene of the incident. Monday 26th October 2015 – 7.10am – Murray MacGregor. A motorcyclist has died and his pillion passenger has been injured in a road traffic collision involving a road sign. A paramedic area support officer came across the crash scene at about 1.30am this morning (Monday) at the junction of Woodrow Drive and Woodrow South in Redditch. An ambulance arrived four minutes after the area support officer discovered the crash. They were backed up by a second ambulance and the MERIT trauma doctor and critical care paramedic. A West Midlands Ambulance Service spokesman said “Unfortunately, it was almost immediately clear that there was nothing that could be done to save the motorcycle rider and he was confirmed dead at the scene. “The pillion passenger, who was estimated to be in his late teens, was disorientated and complaining of chest, left arm and left leg injuries. “He was treated at the scene by ambulance staff before being taken to the Alexandra Hospital in Redditch by ambulance. Sunday 25th October 2015 – 9.15pm – Murray MacGregor. 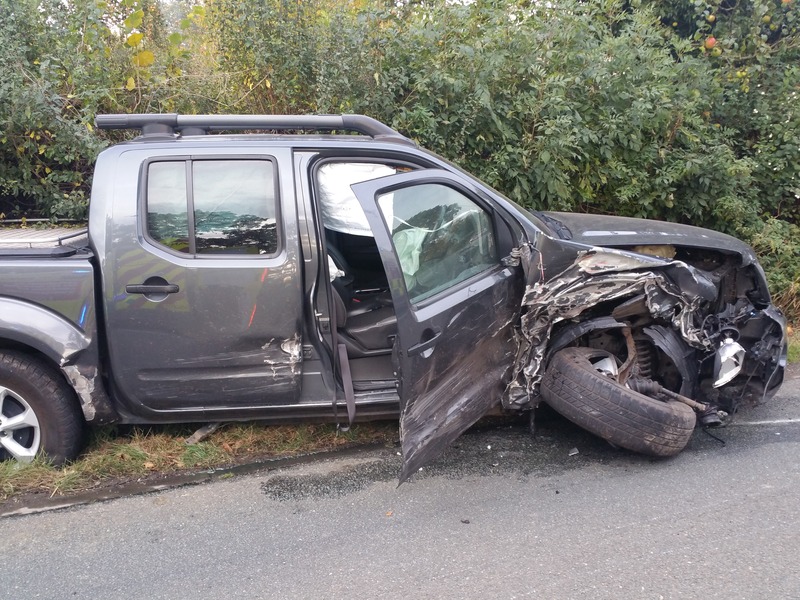 An elderly couple have escaped from the wreckage of the 4×4 they were in through the boot after a collision with a car. 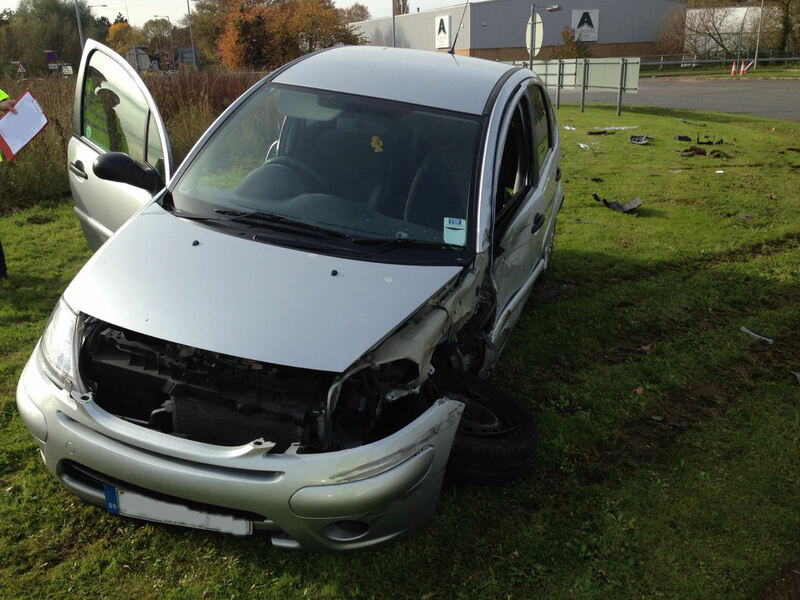 The crash happened at a roundabout on the A46 at Salford Priors in Warwickshire at about 11.50am on Sunday morning. A West Midlands Ambulance Service spokesman said: “The collision happened in the run up to the roundabout but resulted in the Citroen Saxo leaving the road to the side and the Land Rover Discovery crossing the roundabout and ending up facing the wrong direction against the crash barrier. “The elderly couple in it managed to get out through the boot of the vehicle as the doors were stuck. The driver, a man in his 70s had a suspected pelvic injury while his wife, who was in her 60s had a possible left arm fracture. Both were immobilised and ere taken to the Alexandra Hospital in Redditch. Sunday 25th October 2015 – 8.35pm – Murray MacGregor. Two cars that collided on a corner have both spun into hedges some distance apart. The incident happened close to Hilltop Farm on Stafford Road, Lawnhead at around 3.10pm on Sunday afternoon. Three ambulances, a paramedic area support officer and a community first responder from the Eccleshall scheme were sent to the scene. A West Midlands Ambulance Service spokesman said: “Judging by the skid marks on the road, the cars collided on a corner and then spun into the hedge at the side of the road some distance apart. 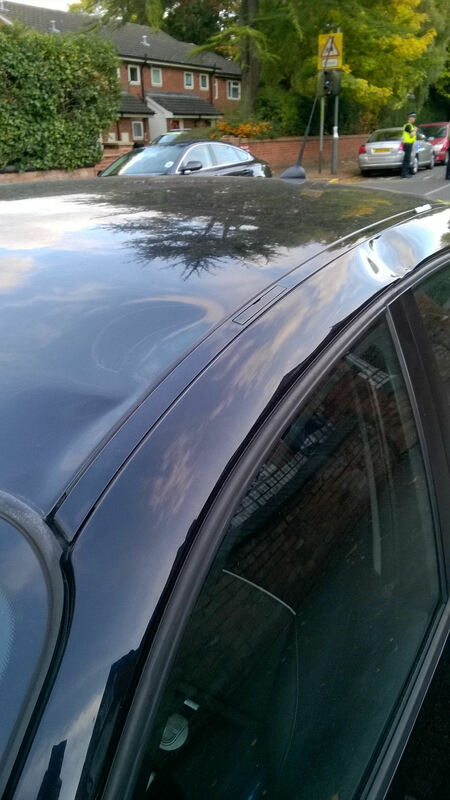 Both vehicles had suffered considerable front offside damage. “The 35 year old driver of the Astra was complaining of pain in both wrists. Due to the level of damage he was immobilised using a neck collar and spinal board before being taken to County Hospital, Stafford. There were a couple in the Navara involved. The driver, a man of about 40 years, managed to get out of the 4×4 but collapsed in road due to a broken ankle. He was immobilised before being taken to hospital in Stafford. The woman in the car, who was a similar age, was complaining of chest injuries from the seatbelt. Again as a precaution, she was immobilised and was also taken to County Hospital. Sunday 25th October 2015 – 7.55pm – Murray MacGregor. One man has died after a car and a coach were involved in a crash on a dual carriageway. The tragic incident happened at about 11.15am on Sunday morning on the Birmingham bound A45 about half a mile from the Land Rover garage. There were five people in the car along with about 20 passengers and the driver on the National Express coach. Four ambulances, two paramedic officers and the Warwickshire and Northamptonshire Air Ambulance were sent to the scene. The aircraft landed on the carriageway. 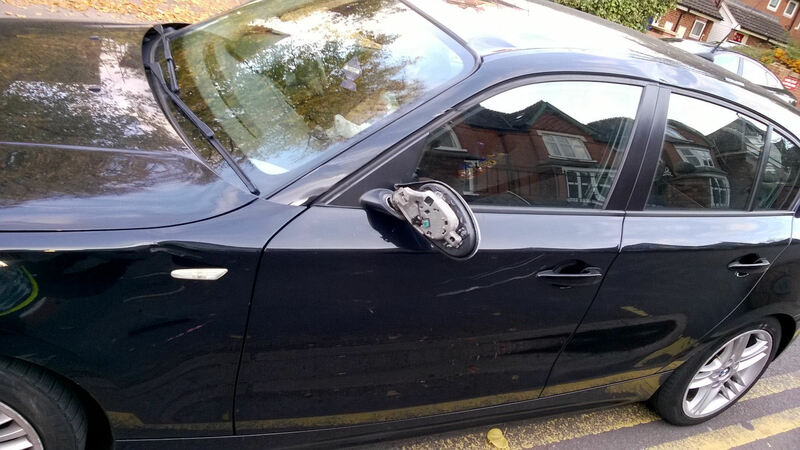 A West Midlands Ambulance Service spokesman said: “On arrival, ambulance staff found a car that had suffered very significant damage to its rear offside. The coach had nearside front damage and the windscreen was badly damaged. “The man who died was in the rear of the car. Sadly it was almost immediately clear that nothing could be done to save him and he was confirmed dead at the scene. “A woman in her 30s who was driving the car had a head laceration; a woman in her 60s had a possible chest injury. She was immobilised using a neck collar and spinal board as was a man in his 60s as a precaution. All three were taken to University Hospital Coventry & Warwickshire. A woman, estimated to be in her late teens or early 20s had suffered a knee injury but after treatment, was discharged at the scene. Sunday 25th October 2015 – 7.10pm – Murray MacGregor. The driver of a car involved in a collision has been anaesthetised at the scene after suffering serious injuries. The crash happened near the Co-op on Keelings Lane in the Northwood area of Stoke on Trent at lunchtime on Sunday. A rapid response vehicle arrived four minutes after the call at 12.08pm. The paramedic was backed up by three ambulances, a paramedic area support officer and a doctor from the North Staffordshire BASICS Doctors scheme. A West Midlands Ambulance Service spokesman said: “The silver and white cars involved had both suffered significant front end damage in the collision. “The most seriously injured patient was the driver of the white car. The 35 year old was semi-conscious and had suspected traumatic abdominal injuries and a head injury. “After assessing his condition, the doctor anaesthetised him at the scene before he was taken on blue lights to the major trauma centre at Royal Stoke University Hospital. Saturday 24th October 2015 – 10.35pm – Murray MacGregor. Two people have been taken to a major trauma centre after the car they were in left the road, went through a wall and then cartwheeled after landing in a ditch. The crash happened on the A429, just north of Wellesbourne at about 5.50pm on Saturday evening. Three ambulances, a rapid response vehicle and a paramedic area support officer were sent to the scene. The response vehicle arrived inside 8 minutes after the 999 call. A West Midlands Ambulance Service spokesman said: “On arrival, ambulance staff found a car that had gone through a wall on a bend into a ditch and had then overturned landing back on its wheels. “A woman, who had been in the rear seat, was out of the car on arrival, though it wasn’t possible to determine how she had got out. She had suffered potentially serious internal injuries and had abdominal pain. “After being immobilised, she was taken on blue lights to the major trauma centre at University Hospital Coventry & Warwickshire. “A man who had been in the front of the car was extricated from the wreckage with the help of firefighters. He had suffered chest injuries from the seat belt. “He too was immobilised and was taken to the same hospital by ambulance. Saturday 24th October 2015 – 2.45pm – Murray MacGregor. No fewer than three air ambulances were sent to the scene of a two car crash which resulted in four patients being injured. The crash between a Land Rover Defender and a small Peugeot happened at about 9.50am on Saturday morning at Lawton Crossroads, the junction of the A4110 and B4529 in Herefordshire. The first person on scene was an off duty Welsh paramedic who started assessing the patients; the first ambulance arrived seven minutes after the call. It was backed up by a second ambulance, a rapid response vehicle, a paramedic area support officer, two BASICS doctors from the MARS scheme and three aircraft: the Midlands Air Ambulances from Cosford and Strensham and the Derbyshire, Leicstershire and Rutland Air Ambulance. 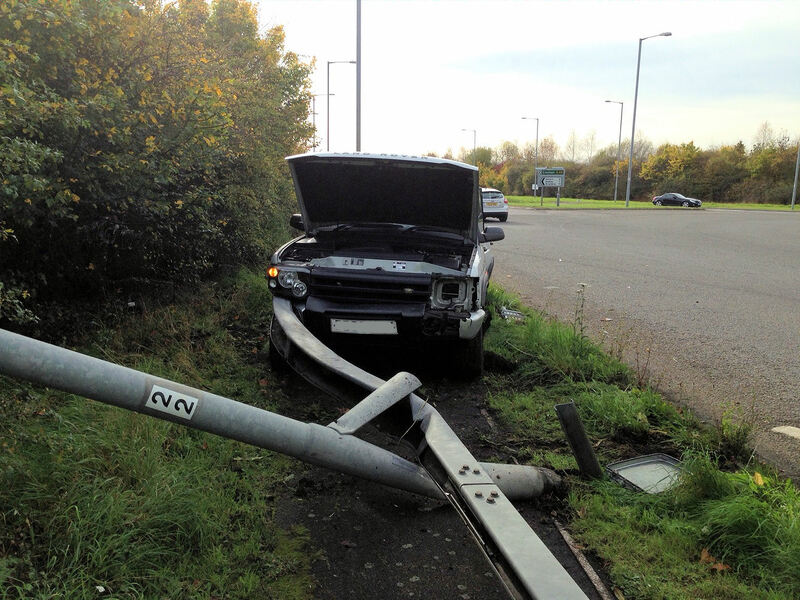 A West Midlands Ambulance Service spokesman said: “The Land Rover had collided with the nearside (left) of the Peugeot. The car had ended up in a hedge seriously damaged on the nearside. “The most seriously injured was a four year old boy in the back on the nearside – he had a serious head injury. He was anaesthetised at the scene before being flown to Birmingham Children’s Hospital, the paediatric major trauma centre for the region. “The front seat passenger, a lady in her 60s, had multiple injuries and was also anaesthetised at the scene before being airlifted to the major trauma centre at the Queen Elizabeth Hospital Birmingham. “The driver, a 21 year old had suffered chest and abdominal injuries. After being rescued from the car, she too was airlifted to the Queen Elizabeth Hospital. Saturday 24th October 2015 – 9.35am – Murray MacGregor. Four people have been hurt, two seriously, after a two car road traffic collision in the early hours of Saturday morning. 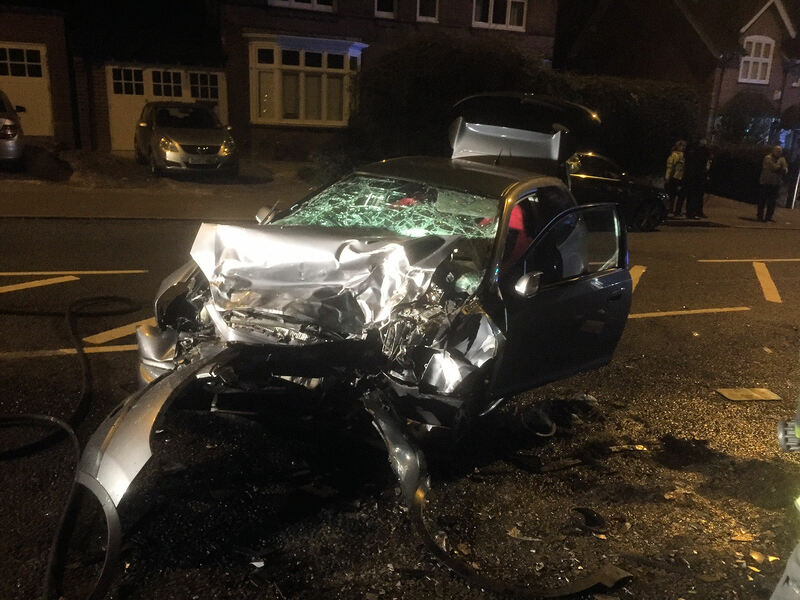 The crash in Linden Road, in the Bournville area of Birmingham happened at 12.20am on Saturday morning and involved a silver car and a black Nissan Qashqai. No fewer than four ambulances, a paramedic area support officer and the CARE Team were sent to the scene. A West Midlands Ambulance Service spokesman said: “On arrival, crews found two cars that had suffered very extensive damage. The Qashqai had nothing left in front of the wheels. The silver car was also badly damaged. “There were two men in their 20s in the silver car. Both had managed to get out of the vehicle. 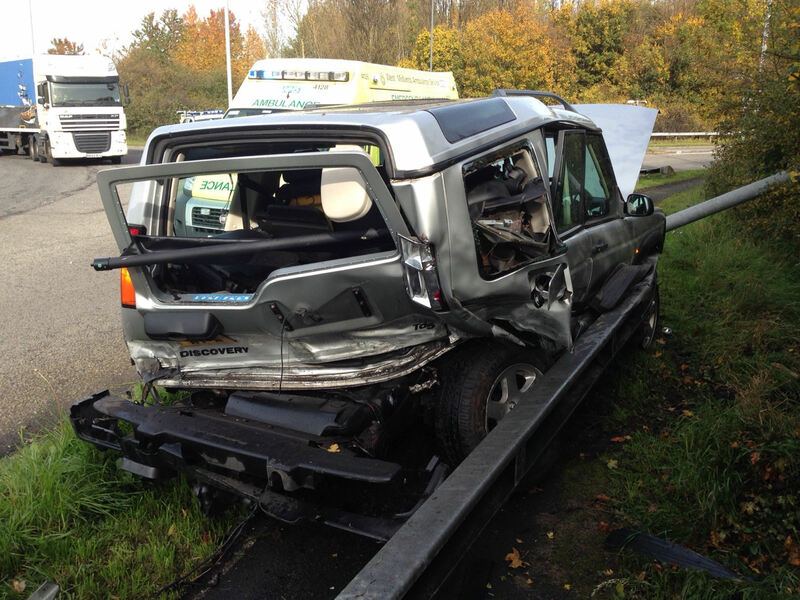 The front seat passenger, who was 23 had suspected fractures to his pelvis and right leg. Both pelvis and leg were put in splints before he was being taken on blue lights to the major trauma centre at the Queen Elizabeth Hospital Birmingham. The CARE Team went with the crew. “The 24 year old driver was complaining of left hip and right elbow pain and was taken to City Hospital. “The front seat passenger of the Nissan also had a pelvic injury. After being extricated by ambulance and fire crews, the 54 year old was also taken to the Queen Elizabeth. “The woman driving had pain in her back and right wrist and had a possible left wrist fracture. She also went to the Queen Elizabeth. Saturday 24th October 2015 – 8.17am – Murray MacGregor. Three youngsters have escaped what could have been a very different set of circumstances because of timing and wearing seatbelts. All three emergency services were called to the A46 between Evesham and Sedgeberrow at about 1.15am on Saturday morning, just at a road junction. Three ambulances, two rapid response vehicles and the MERIT doctor and critical care paramedic were sent to the scene. 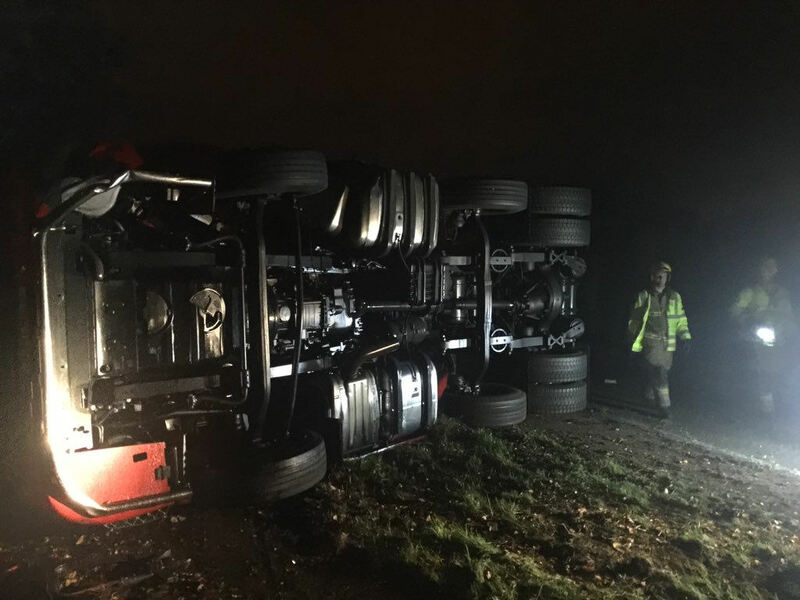 A West Midlands Ambulance Service spokesman said: “When crews arrived they found a fully loaded milk tanker on its side and the fuel tank had fractured leaking diesel across the road. A short distance away was a small car. The collision with the tanker had ripped the engine block out of the vehicle and it was lying on the opposite side of the road to the car. “Despite having a broken leg, the driver of the tanker had managed to climb out of is cab via a sun roof and was lying in the road nearby. The 48 year old had his leg splinted and was immobilised before being taken to Worcestershire Royal Hospital. “There were two men and a woman in the car, all estimated to be in their late teens or early 20s. The two passengers had managed to get out prior to ambulance staff arriving. The driver was still sat in his seat. Ambulance staff worked with fire crews to have the roof removed. Once out and on the back of an ambulance, the man appeared to have relatively minor injuries – bruising to his abdomen. “The woman had minor injuries and was able to walk onto the back of an ambulance. The other man was immobilised as a precaution. All three were taken to the Alexandra Hospital in Redditch. Friday 23rd October 2015 – 2pm – Steve Parry. A cyclist has been taken to hospital following a road traffic collision in Coventry this morning. West Midlands Ambulance Service was called to the junction of Kenilworth Road and Fletchamstead Highway at just before midday. An ambulance; a paramedic support officer together with the Warwickshire and Northamptonshire Air Ambulance crew travelling in a response car attended the scene. A West Midlands Ambulance Service spokesman said: “Crews responded to a collision between a car and cyclist in Coventry this morning. 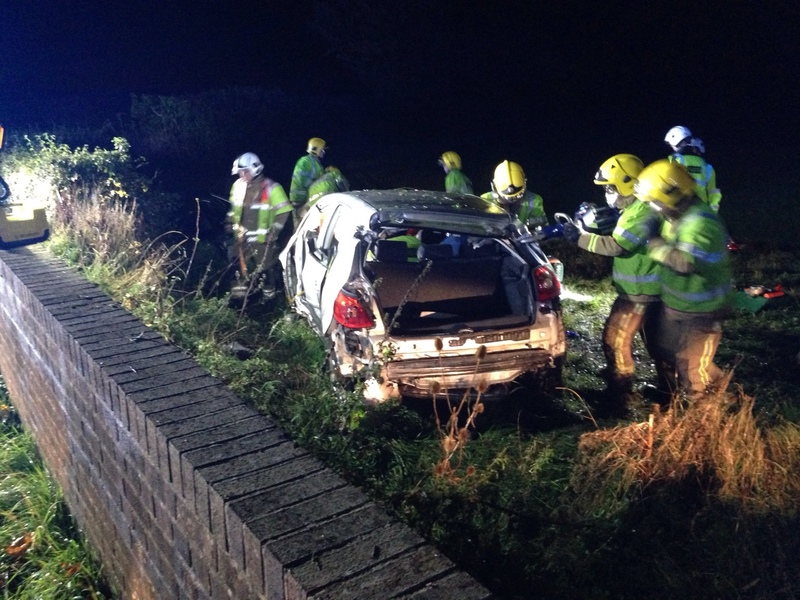 “Crews treated a man in his twenties for serious pelvic injuries and fractures to both legs. “The patient was immobilised with the use of a pelvic binder together with a neck collar and placed on a spinal board. He was also given pain relief before being taken by land ambulance to the University Hospital Coventry and Warwickshire for further assessment and treatment. “A doctor and paramedic from the air ambulance also travelled to hospital with the patient. Thursday 22nd October 2015 – 4.30pm – John Hawker. Two people have been fortunate to escape much more serious injuries after two cars crashed and set on fire in Worcester this morning. The incident occurred on the B4203, near Stanford Bridge at around 8.00am. A rapid response vehicle, an ambulance and a paramedic officer attended the scene. A West Midlands Ambulance Service spokesman said: “Crews arrived to find two cars that had crashed and set on fire. Fortunately, the occupants of the cars were already out of the vehicles and at a safe distance after being helped by other motorists. “The two woman, one from each car, received treatment at the scene by medics for their injuries. A woman in her late 50’s was treated for a suspected fractured ankle, and a woman in her early 20’s received treatment for a shoulder injury. “After treatment, both were transferred by ambulance to Worcester Royal Hospital for further treatment. Thursday 22nd October 2015 – 9.40am – John Hawker. A golf club in Warwickshire has joined the ‘life saving list’ thanks to a project by WMAS. Stonebridge Golf Centre in Meriden is the latest club to receive a defibrillator from the Trust on Tuesday 6th October. Emma Bogle, the Trust’s Head of Community Response, said: “Golf is the 5th biggest participation sport in the UK and if someone’s heart stops half a mile out on the fairway it’s vital they get help fast. Thursday 22nd October 2015 – 7.15pm – Murray MacGregor. Two people have been injured after the car they were in went through a large metal fence, down an embankment and into a tree. The crash happened just at the end of the railway bridge on Wednesbury Road in Walsall at about 2.45am this morning (Thursday). Two ambulances, a paramedic area support officer and the MERIT trauma doctor and critical care paramedic were sent to the scene. A West Midlands Ambulance Service spokesman said: “On arrival, crews found a car that had suffered very significant damage, especially to the passenger side. “Both occupants, who were estimated to be in their 30s, had managed to get out, though the woman, who was the front seat passenger, had a reduced level of consciousness. “The woman had a nasty laceration to her face and a leg injury. After treatment at the scene, she was taken to the Major Trauma Centre at the Queen Elizabeth Hospital Birmingham with the doctor travelling with the crew. She was expected to need surgery for the facial injury. Wednesday 21st October 2015 – 8.00pm – Murray MacGregor. A woman who was left hanging by her seatbelt has been rescued by ambulance staff and firefighters through a panoramic sunroof. 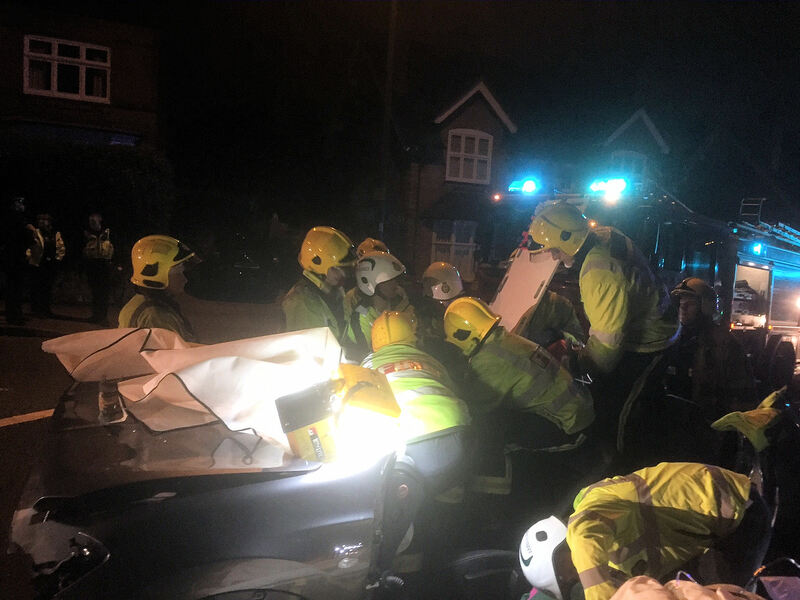 The rescue happened after a two car crash at the junction of Selly Oak Road and Northfield Road in the Bournville area of Birmingham at about 6.10pm on Wednesday evening. A West Midlands Ambulance Service spokesman said: “On arrival crews found one car that was on its side. The car was resting on the passenger side with the driver still in her seat, mid air being held there by the seatbelt. “Ambulance staff worked with firefighters to get her out. The car had a large panoramic sun roof, which the fire crews cut out. This allowed the woman, who was estimated to be in her 40s, to be very carefully brought out of the vehicle and immobilised using a neck collar and spinal board. “After she was taken onto the ambulance, she was assessed fully. Apart from some abdominal pain, she appeared to have suffered only minor injuries. As a precaution she was taken to the Queen Elizabeth Hospital Birmingham for further observation. Wednesday 21st October 2015 – 4.15pm – Chris Kowalik. Would you like to join West Midlands Ambulance Service’s growing band of volunteer lifesavers? We’re looking for keen and willing potential recruits across Shropshire and Herefordshire for our next Community First Responders (CFRs) training courses. The next course in Shropshire is in January and interviews will be held on November 21st. CFRs are everyday members of the public who are trained in a number of assessments and basic lifesaving techniques including the use of a defibrillator, a device used to restart the heart of someone who has suffered a cardiac arrest. Their availability, close proximity and local knowledge are among their many assets. CFRs will be called by the ambulance service’s control room to medical emergencies in their area while an ambulance is en-route. They are vital in life-threatening situations, particularly in the case of a cardiac arrest and trauma when every minute counts. Shropshire’s Community Response Manager Cliff Medlicott said: “Volunteers come from all walks of life. 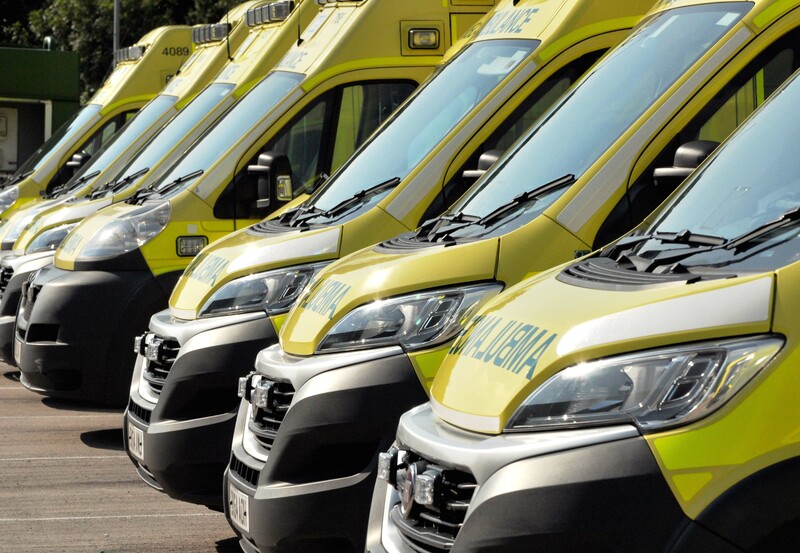 When they make themselves available to respond they can continue to go about their daily lives, but if an emergency call is received by the ambulance service within a five or six mile radius, they are sent and always backed-up by an emergency ambulance service vehicle. “Successful applicants will attend a nationally recognised training course covering Basic Life Support and Defibrillation, Medical Emergencies, Traumatic Emergencies and Preparing for Active Duty. They will then train alongside ambulance crews before going ‘live’”. Look out for the advertisement which will appear soon on the NHS Jobs website https://www.jobs.nhs.uk/ . Tuesday 20th October 2015 – 11.15pm – Murray MacGregor. The rider of a motorcycle has died after a collision with a car despite the efforts of ambulance staff. The collision happened at the junction of Queens Road and Church Lane in the Aston area of Birmingham at just before 8.15pm this evening (Tuesday). An ambulance, a paramedic officer and the MERIT Trauma Doctor and Critical Care Paramedic were sent to the scene. A West Midlands Ambulance Service spokesman said: “An ambulance arrived on scene four minutes after the 999 call. On arrival staff found a young man with very severe injuries. “He was placed in the ambulance and staff carried out advanced procedures but despite all their efforts, tragically, it was not possible to save him and he was confirmed dead at the scene. Tuesday 20th October 2015 – 7.00pm – Murray MacGregor. Ambulance staff are once again urging cyclists to wear a helmet after a cyclist suffered what was initially believed to be a serious head injury after a collision with a car. It happened in Oxford Road in Moseley, Birmingham, shortly after 4.30pm today (Tuesday). A senior paramedic officer and a paramedic attended in rapid response vehicles along with an ambulance crew. A West Midlands Ambulance Service spokesman said: “The cyclist had collided with the side of the car and left a dent in the roof just above the doors. “The man, who was believed to be in his 20s, was initially quite combative, which normally indicates a head injury. He also had a cut above his left eye and an abrasion to his left shoulder. “After assessment and treatment at the scene, he was taken on blue lights to the major trauma centre at the Queen Elizabeth Hospital Birmingham where he underwent further tests. Tuesday 20th October 2015 – 4.15pm – Chris Kowalik. 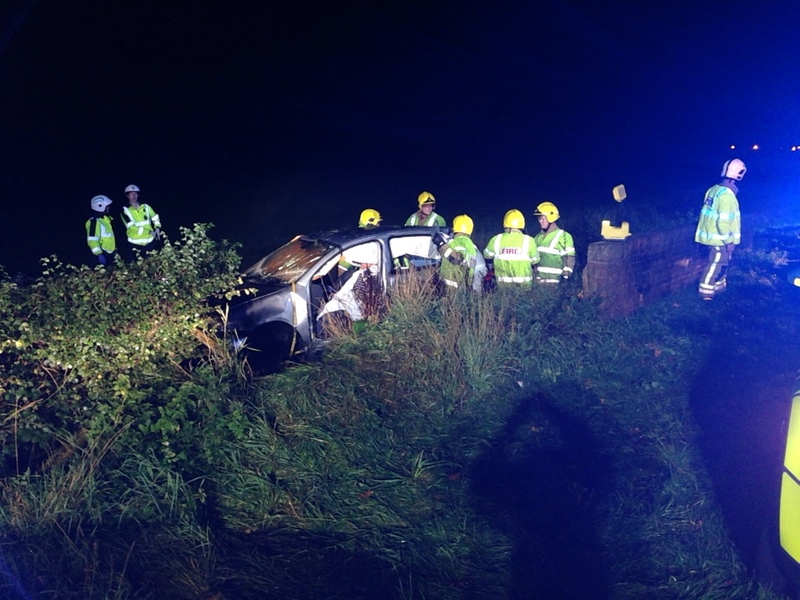 A woman had only minor injuries after the car she was in left the M5 in Worcestershire and went down an embankment. 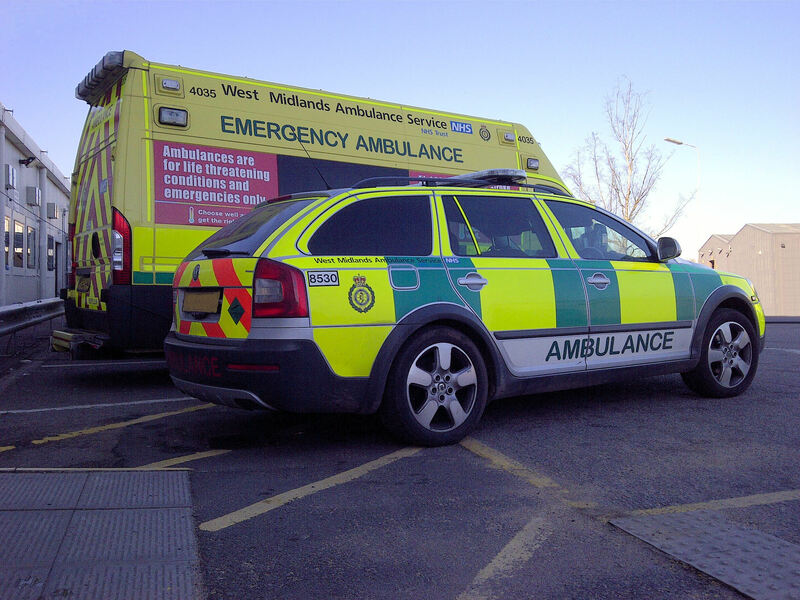 West Midlands Ambulance Service was called to the southbound carriageway at junction 5 shortly after 8.30am today. A West Midlands Ambulance Service spokesman said: “The woman who is in her twenties was initially assessed in her car by ambulance crews. When they cleared her of any spinal injury, she was able to get out of the car herself. Monday 19th October 2015 – 10.55pm – Murray MacGregor. A man has died after two cars collided on a country road in Warwickshire. The tragic incident happened on the A4189 Henley in Arden to Warwick road near to the Crab Mill, which is between Preston Bagot and Claverden. A rapid response vehicle was on scene within four minutes of the 999 call at 7.10pm on Monday evening. A paramedic officer came across the crash shortly afterwards and they were backed up by two ambulances, a paramedic area support officer and the MERIT Trauma Doctor. A West Midlands Ambulance Service spokesman said: “On arrival, crews found two cars that had both suffered very significant front end damage. “Sadly, there was nothing that could be done to save the driver of one car and he was confirmed dead at the scene. “A man in his late 70s from the other car was trapped for a period. He had suffered possible fractures to his shoulder, wrist and ankle on the left side. “After condition was stabilised at the scene, he was taken to the major trauma centre at the Queen Elizabeth Hospital in Birmingham by ambulance. “There were two further patients from a third car that is believed to have struck one of the other cars already involved. Monday 19th October 2015 – 7.40am – Chris Kowalik. 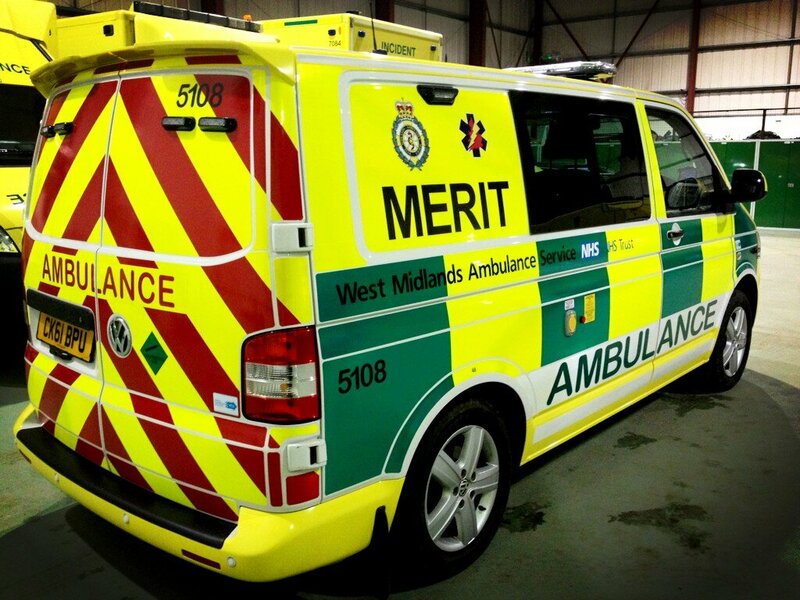 A woman has been taken to a major trauma centre after colliding with a car in Birmingham. West Midlands Ambulance Service was called to Soho Road, Handsworth shortly before 5.40am today. Two paramedic area support officers attended in a rapid response vehicle. Also attending were an ambulance and the Medical Emergency Response Incident Team (MERIT) consisting of a trauma doctor and a critical care practitioner. A West Midlands Ambulance Service spokesman said: “The woman pedestrian had suffered a serious head injury and had gone into cardiac arrest. “Crews at the scene immobilised her and applied a pelvic splint and she was given fluids. Advanced life support techniques were also performed on her. Note to Editors: We are unable to provide further condition checks. Sunday 18th October 2015 – 9am – Jamie Arrowsmith. West Midlands Ambulance Service was called to Birmingham Road, near to Wall Island, Lichfield, just after 8.45pm and sent two ambulances, a paramedic in a rapid response vehicle, a paramedic area support officer and a doctor to the scene. A West Midlands Ambulance Service spokesman said: “Crews arrived to find a man who was in cardiac arrest when his push bike and a van had been in collision. “Bystanders were already administering CPR prior to our arrival. “Ambulance staff took over and began giving advanced life support but unfortunately it quickly became apparent that nothing could be done to save him and he was confirmed dead at the scene. Saturday 17th October 2015 – 3.30pm – Chris Kowalik. 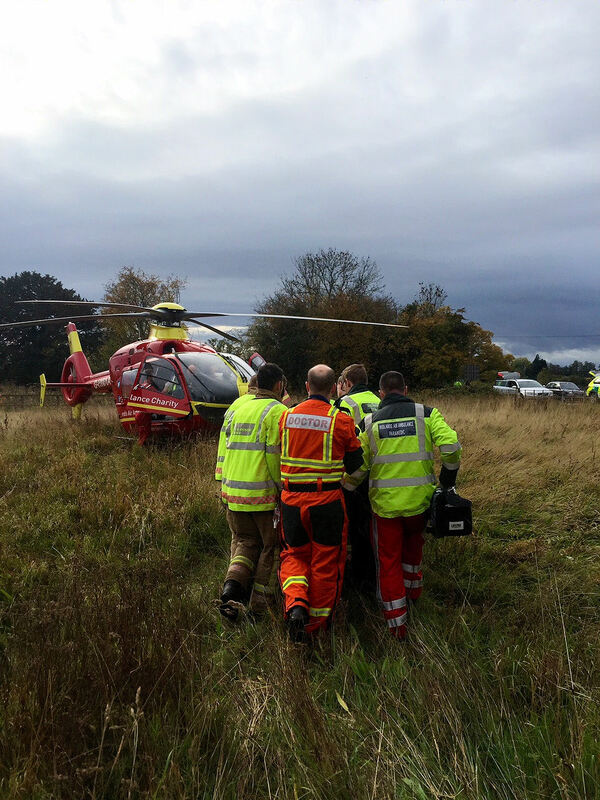 An off-road motorcyclist has been airlifted to hospital after coming off his bike on a track in Solihull. West Midlands Ambulance Service was called to Hampton-in-Arden shortly before 11.55am today. A paramedic area support officer in a rapid response vehicle, an ambulance crew and the Midlands Air Ambulance from Cosford attended. A West Midlands Ambulance Service spokesman said: “The man who is in his forties was fully equipped with safety gear and clothing. He fell from his motorbike and suffered an isolated head injury. He was otherwise in a stable condition. Saturday 17th October 2015 – 11.45am – Chris Kowalik. A boy has died after the car he was in hit a tree in Birmingham. West Midlands Ambulance Service was called to Stechford Road in the Hodge Hill area of the city shortly after 11.05pm yesterday (Friday). 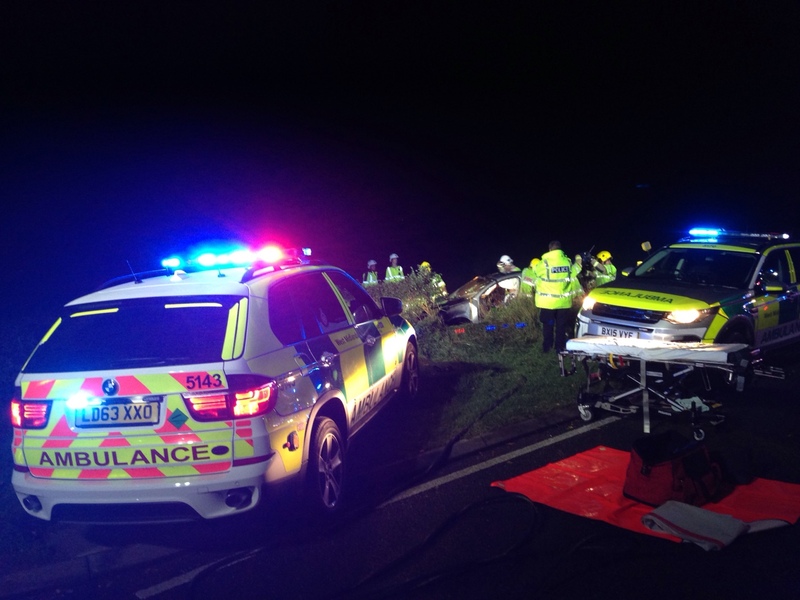 A paramedic area support officer in a rapid response vehicle, two ambulance crews and the MERIT (Medical Emergency Response Incident Team) trauma team consisting of a trauma doctor and a critical care practitioner attended. 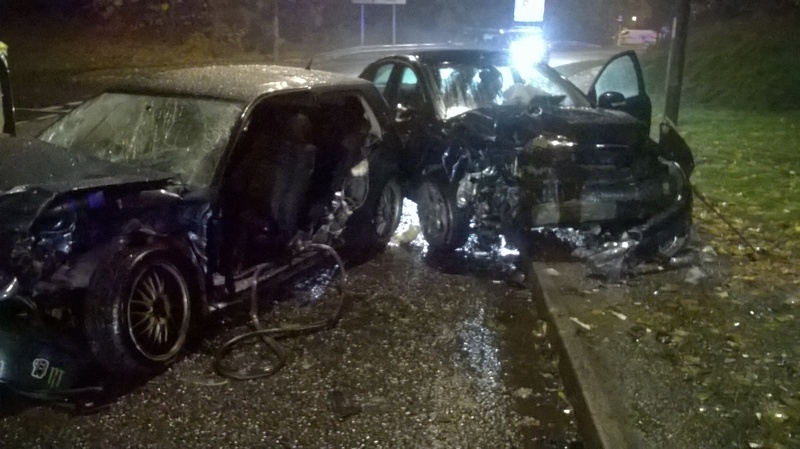 Last night West Midlands Ambulance Service was called to reports of a five car crash in Birmingham, fortunately there were only two people with relatively minor injuries. Two paramedic officers attended in rapid response vehicles, joined by two ambulance crews and the West Midlands Central Accident Resuscitation & Emergency (CARE) Team. A West Midlands Ambulance Service spokesman said: “A 12 year old boy had pain in his knee and was unable to put weight onit. He was helped by crews into an ambulance and takento Heartlands Hospital for precautionary checks. “A man who had neck pain was immobilised with the use of a spinal board and neck collar and was taken to the same hospital, again as a precaution. 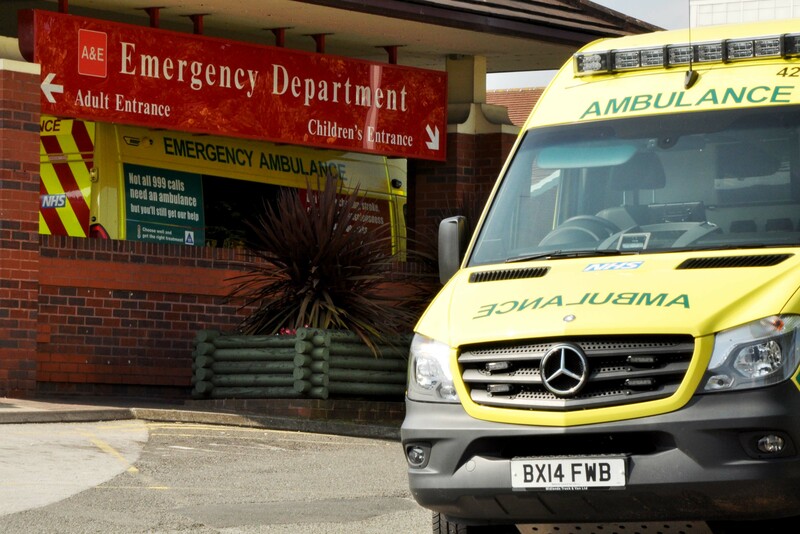 The West Midlands Central Accident Resuscitation & Emergency (CARE) team is a group of approx 60 volunteer Doctors and Nurses who provide a medical team in support of the West Midlands Ambulance Service. Each team consists of a Doctor, Nurse, WMAS Incident Officer and a Trainee. The team is able to offer advanced surgical intervention, airway and equipment support. The CARE Team was formed in 1990 and is affiliated with the British Association for Immediate Care (BASICS). The Scheme is funded entirely by charitable donations and is a registered charity number 1129027. Friday 16th October 2015 – 4.35pm – Chris Kowalik. A group in Ludlow that has been behind making a defibrillator accessible within a few minutes from anywhere in the town is about to run more lifesaving training sessions. Members of the public are invited to Rockspring Community Centre in Sandford Road, Ludlow SY8 1SX to learn how to perform CPR and how to use a defibrillator, a device that could restart the heart of someone who suffers a cardiac arrest. It’s been organised by the group ‘Ludlow Defib 4 You’ and will involve staff from West Midlands Ambulance Service who are providing the training for free. Refresher training is also available by arrangement. ‘Ludlow Defib 4 You’ has been involved in the siting of defibrillators at Ludlow Assembly Rooms, Rockspring Community Centre, Homecare, Ludlow Mascall Centre and Culmington Village Hall. Friday 16th October 2015 – 1.55pm – Chris Kowalik. A country club in Shropshire now has a defibrillator that could be a lifesaver should someone there suffer a cardiac arrest. West Midlands Ambulance Service has given the device to the club at Lion Quays in Oswestry and, with the help of Community First Responders, trained staff in how to use it and how to deliver CPR. 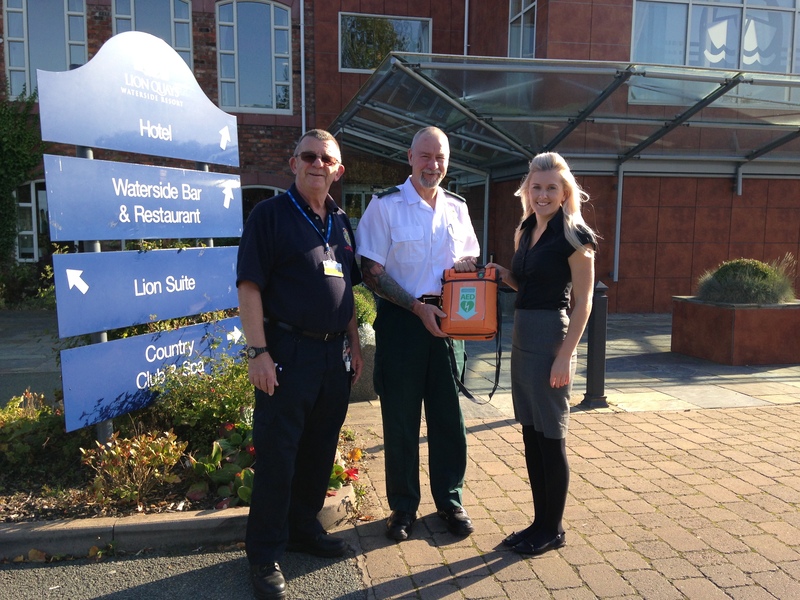 This is in addition to a defibrillator that is already in place at the Lion Quays Hotel. Community Paramedic Officer Terry Foster said: “The quicker a defibrillator shock can be given, the greater the chance a patient in cardiac arrest has of surviving. 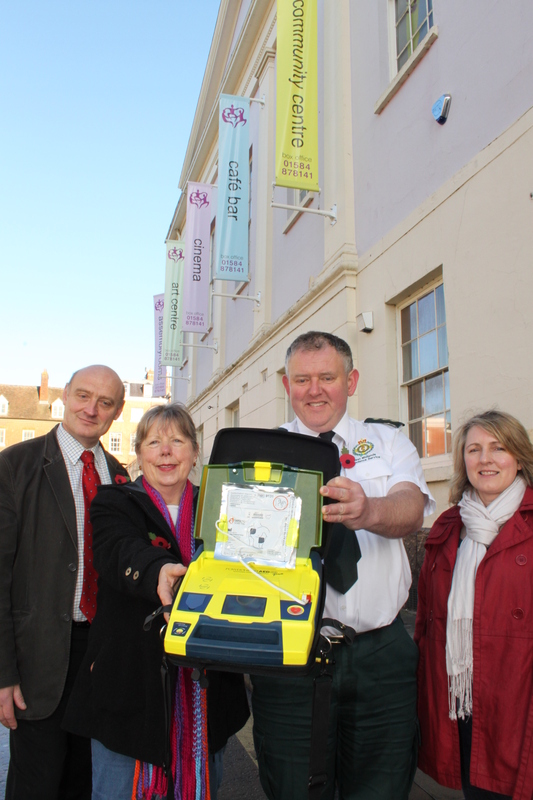 Pictured left-to-right: Nigel Keighley (co-ordinator of Oswestry and District Community First Responders), Terry Foster (Community Paramedic Officer, West Midlands Ambulance Service), Suzanne Williams (Sales Manager, Lion Quays Country Club). Do you know how to restart a heart? Friday 16th October 2015 – 1.30pm – Claire Brown. It’s Restart a Heart Day today. Would you know what to do if someone you loved had a cardiac arrest? When someone suffers a cardiac arrest, the longer they wait for CPR the less likely they are of surviving. Every second counts when your heart has stopped beating. Ian Hough, 59 from Stourport-on-Severn, is a cardiac arrest survivor and knows all too well the benefits of CPR and a defibrillator. His story has been turned into a powerfully emotional short film called ‘Pull Through’, produced by his employer drpvideo, to encourage other communities to get a defibrillator. If you have somewhere which is accessible to the public and are committed to training your local community, visit http://www.bhf.org.uk/defibs to apply for a free defibrillator. The British Heart Foundation has been given £1million by the Department of Health to offer free defibrillators and CPR training to communities across England. As your local ambulance service we’ll support your application. To contact West Midlands Ambulance Service about defibrillators, please email cfradmin@wmas.nhs.uk. Pictured Left to Right: Nick Montandon – WMAS Area Manager Herefordshire, Eddie O’neill – Deputy Director of Service Delivery 2gether, Dr Arif Mahmood – Consultant in Public Health for Herefordshire, Jon Barnes – Chief Operating Officer WVT, Dr Andy Watts – GP and clinical lead HCCG, and Cath Allen WVT health@work vaccinator. Local health and care staff are the first to step up and have their flu jabs in order to stay well this winter and protect their patients and loved ones from the virus. They have also joined forces this year to urge at risk groups and frontline health and care colleagues across the county to take up the free flu vaccination and stay well this winter. Each winter hundreds of thousands of people across the country see their GP and tens of thousands are hospitalised because of influenza (flu), which could be prevented by having the flu vaccine once a year. This year’s local flu vaccination campaign has been launched jointly by Herefordshire Clinical Commissioning Group (HCCG), Wye Valley NHS Trust (WVT), Public Health, Herefordshire Council, 2gether NHS Foundation Trust, and West Midlands Ambulance Service (WMAS), as part of the national seasonal flu vaccination campaign. The national flu vaccination campaign launched across the UK last week – targeting people of all ages including people with a long-term health condition, pregnant women, and parents of children aged 2 to 4 and over 65s, encouraging uptake of the flu vaccine among these most at-risk groups. Around 1000 front line staff from HCCG, WVT, Public Health, Herefordshire Council, 2gether and WMAS, so far have had or have booked their flu vaccination this year to help to protect patients and service users. Dr Andy Watts, GP and clinical lead for the Herefordshire Clinical Commissioning Group (HCCG), said: “As a GP I’m recommending that all of my patients in at risk groups are vaccinated against flu and for everyone to ensure they keep themselves healthy throughout the Winter flu season. Flu is not the same as the common cold, it is much more serious and can have serious consequences, especially for those patients with additional health problems. “For anyone in the at risks groups, for example pregnant women, over 65’s, carers, people who have a health condition or weak immune system, it is important that they take action by contacting their GP early in the flu season for the flu vaccination or the nasal spray for children aged two to four years, which is provided free of charge. “I would urge all health and care frontline workers across Herefordshire, including hospital, ambulance, social care, and mental health service staff, to make sure they are vaccinated to protect themselves and reduce the risk of passing on the illness to their patients and their families”. For most healthy people, flu is an unpleasant but usually self-limiting disease with recovery taking up to a week. However, people in at risk groups are at particular risk from the more serious effects of flu. Dr Arif Mahmood, Consultant in Public Health for Herefordshire, said: “Flu vaccination can help protect people who are at greater risk of getting seriously ill and being admitted to hospital. The nasal spray is a quick, easy and painless way to help prevent pre-school age children catching flu and the vaccine also helps to reduce the spread of flu to those who are more vulnerable. Jon Barnes, Chief Operating Officer at Wye Valley NHT Trust added: “We are delighted that this early in the campaign many of our staff, including doctors, nurses, midwives, physiotherapists, and community staff, have had their flu vaccine. Our vaccinators are offering the flu jab to staff as they arrive at work, and at drop in clinics in our hospitals, community sites, and on the wards. “It is our responsibility to protect our patients as healthcare providers. It is therefore vital that every member of our staff gets vaccinated and supports this year’s local flu vaccination campaign. If we reduce the chances of staff contracting flu, we can really drive down the possibility of passing it on to our patients”. 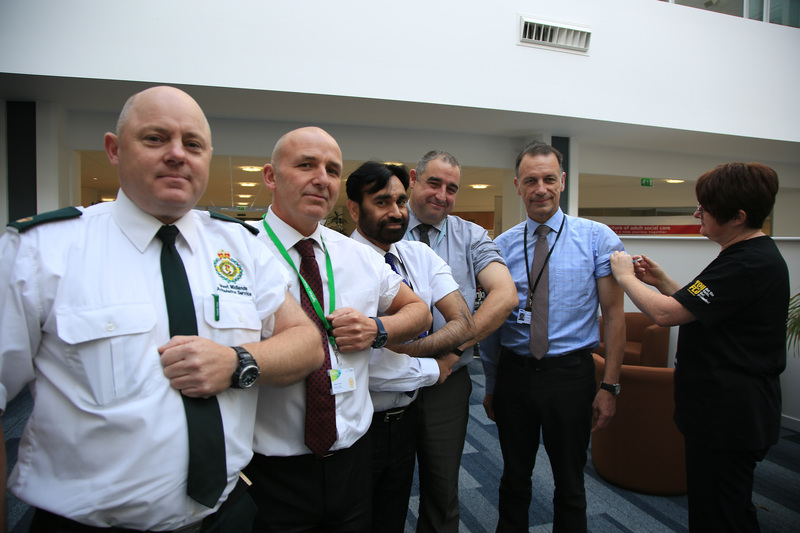 Left to Right: Nick Montandon – WMAS area manager Herefordshire, Eddie O’neill – Deputy Director of Service Delivery 2gether, Dr Arif Mahmood – Consultant in Public Health for Herefordshire, Jon Barnes – Chief Operating Officer WVT, Dr Andy Watts – GP and clinical lead HCCG, and Cath Allen WVT health@work vaccinator. Thursday 15th October 2015 – 8.30pm – John Hawker. 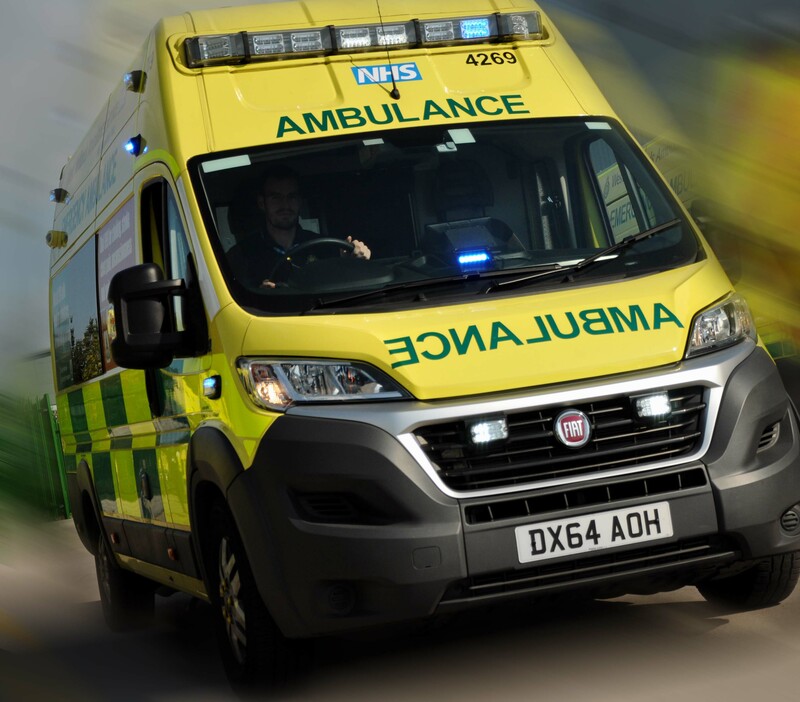 West Midlands Ambulance Service can confirm it was called to the junction of Brinklow Road and Alwold Road, Weoley Castle at around 4.20pm this afternoon to reports of a serious RTC. A rapid response vehicle, an ambulance, a paramedic officer, a BASICS Doctor and the Midlands Air Ambulance from Cosford attended the scene. 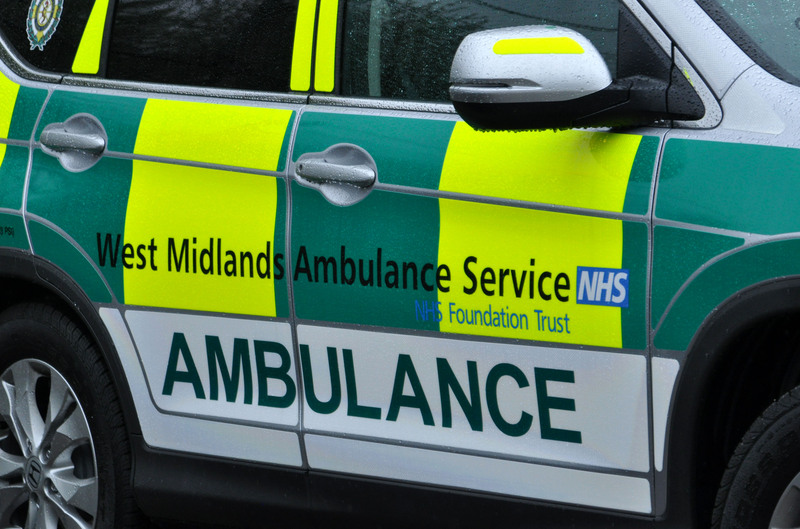 A West Midlands Ambulance Service spokesman said: “Crews arrived to find a motorcyclist that had suffered serious injuries in a crash and was in cardiac arrest. Thursday 15th October 2015 – 5.20pm – John Hawker. Staff at a sports centre in Shifnal have been praised by medics after their quick actions help revive a man who suffered a cardiac arrest whilst running on a treadmill. West Midlands Ambulance Service were called to Idsall School and Sports Centre, Coppice Green Lane, Shifnal at around 12.45pm this lunchtime. A rapid response paramedic, an ambulance, a paramedic officer and the Midlands Air Ambulance from Cosford where dispatched to the incident. A West Midlands Ambulance Service spokesman said: “Crews arrived to find staff at the leisure suite carrying out excellent CPR on the man and using the defibrillator that is in place at the venue. “Medics took over resuscitation attempts and carried out advanced life support. Following several attempts to restart the man’s heart, he started to make respiratory effort. Further treatment was carried out at the scene and by the time he was ready to be airlifted to hospital he was conscious and talking. 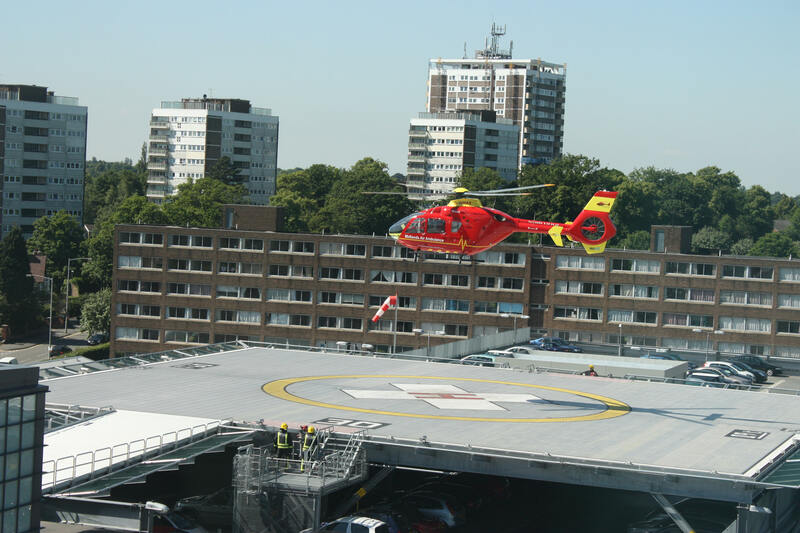 “The man was airlifted to New Cross Hospital for further specialist emergency treatment. “It is very early days for the man and he is extremely poorly, but the staff’s quick actions have given him the best chance of survival. Thursday 15th October 2015 – 4.35pm – John Hawker. 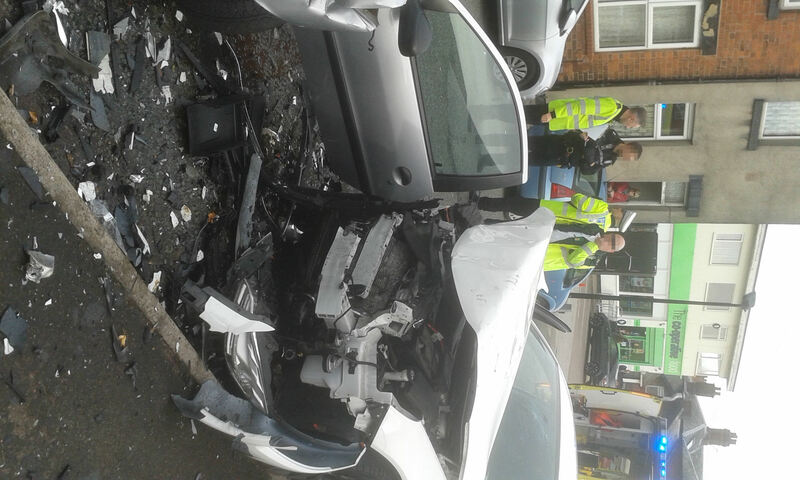 A man has suffered a chest injury after a two vehicle crash in Aldridge this afternoon. West Midlands Ambulance Service was called to Stubbers Green Road at around 1.55pm. A rapid response vehicle, an ambulance and the Midlands Air Ambulance from Stafford attended the scene. A West Midlands Ambulance Service spokesman said: “Crews arrived to find a man who had been taken out of his car after suffering a chest injury. “The man, believed to be in his 80’s, received emergency treatment at the scene and his condition was stabilised. “Following treatment the man was airlifted to Queen Elizabeth Hospital Birmingham for further treatment. Thursday 15th October 2015 – 12.10pm – John Hawker. A man has been seriously injured after being run over by a dumper truck at a building site in Staffordshire this morning. The incident occurred at a new housing development in Milestone Way, Burntwood at just before 9.30am. A paramedic in a rapid response vehicle, an ambulance, a paramedic officer and the Midlands Air Ambulance from Staffordshire attended the scene. A West Midlands Ambulance Service spokesman said: “Crews arrived to the site to find the man had suffered serious leg injuries after being run over by the dumper truck. The truck was fully loaded at the time of the incident. “The man, believed to be in his 30’s, received emergency treatment at the scene including pain relief. His injuries included a suspected fractured and dislocated ankle and also severe lacerations to his legs. Thursday 15th October 2015 – 10.40am – Chris Kowalik. West Midlands Ambulance Service crews have spent the night at a large flat fire in Birmingham that resulted in 19 people from the building being assessed by medics and four being treated and transferred to hospital. A 999 call was received shortly before 10.55pm on Wednesday evening to Brownfield Road in the Shard End area of the city. Three ambulances, the Hazardous Area Response Team and the MERIT trauma team consisting of a trauma doctor and critical care paramedic attended. An advanced paramedic in a rapid response vehicle and a paramedic area support officer in a rapid response vehicle attended. 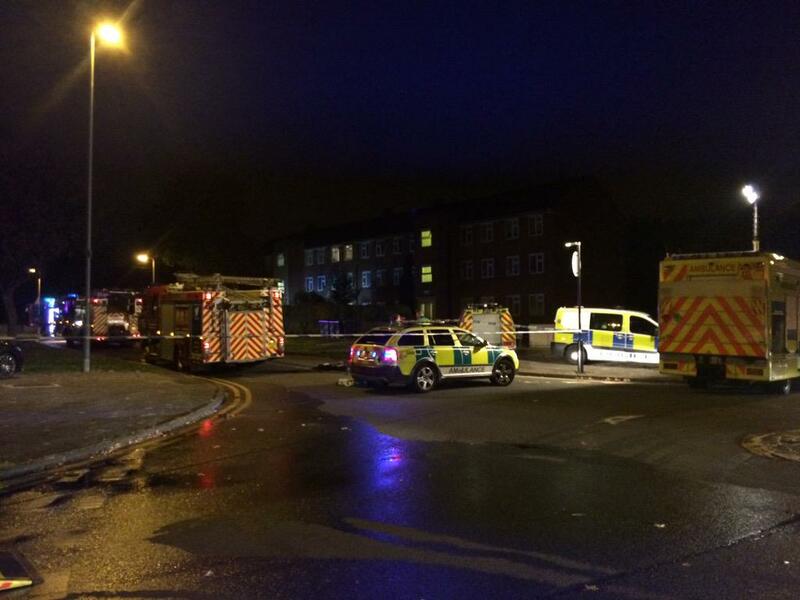 A West Midlands Ambulance Service spokesman said: “The fire was on the second floor of a three storey block of flats. There was a lot of smoke which meant the fire service had to rescue people via the stairwell or the flat above. 19 people were led to safety and assessed with one young baby being treated by medics and then taken to Heartlands Hospital as a precaution. 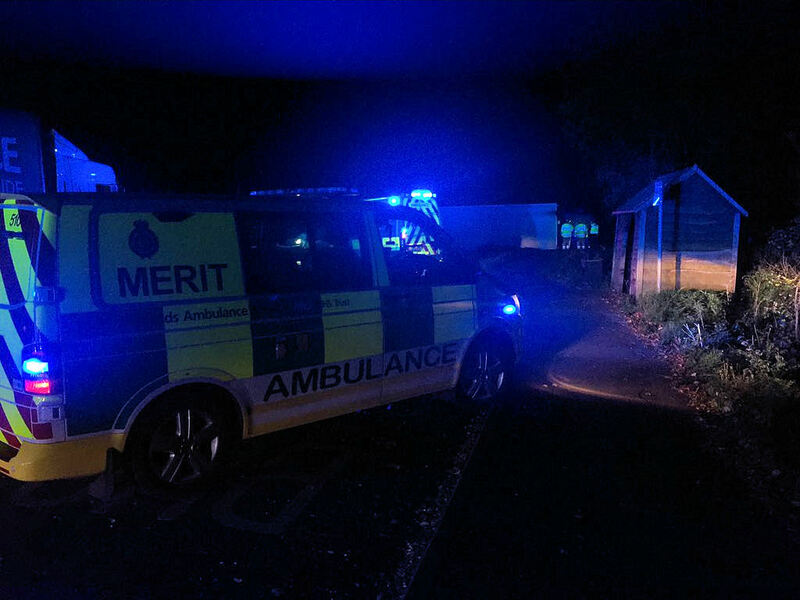 “A woman in her 20s and an 11 year old boy were also treated by ambulance crews and then taken to the same hospital to be treated for smoke inhalation. A further man was treated at the scene by medics and also transferred to hospital. Wednesday 14th October 2015 – 3.30pm – Jamie Arrowsmith. 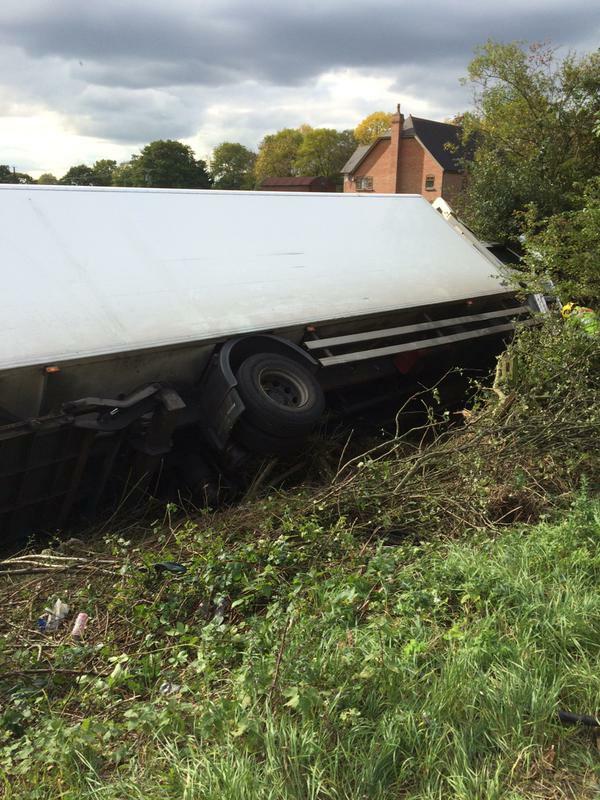 A lorry ended up on its side after leaving the M6, crashing through a barrier and travelling down a bank this afternoon. The incident took place on the northbound carriageway between junctions 14 and 15 shortly after 1.50pm and West Midlands Ambulance Service sent an ambulance, a paramedic area support officer and a doctor to the scene. A West Midlands Ambulance Service spokesman said: “The driver of the lorry, a man believed to be in his 50s, had managed to free himself from the vehicle prior to the arrival of ambulance staff. “He was fully assessed but luckily had escaped injury in the incident and was discharged at the scene. Wednesday 14th October 2015 – 2.45pm – Jamie Arrowsmith. A motorcyclist has been anaesthetised after suffering multiple serious injuries following a collision with a stationary car this afternoon. West Midlands Ambulance Service was called to Courtland Avenue in Coventry, shortly before 12.30pm and sent an ambulance, a paramedic area support officer and the Warwickshire and Northamptonshire Air Ambulance to the scene. A West Midlands Ambulance Service spokesman said: “The man, who was wearing a helmet, was unconscious when crews arrived at scene. “He had suffered a serious head injury in the collision, as well as pelvic, chest and arm injuries. “In order to stabilise his condition he was anaesthetised by the doctor from the air ambulance. “He was fully immobilised before being transported by land ambulance to University Hospital Coventry and Warwickshire. The doctor travelled on the back of the ambulance to continue treatment en-route to the hospital. Wednesday 14th October 2015 – 8.30am – Chris Kowalik. 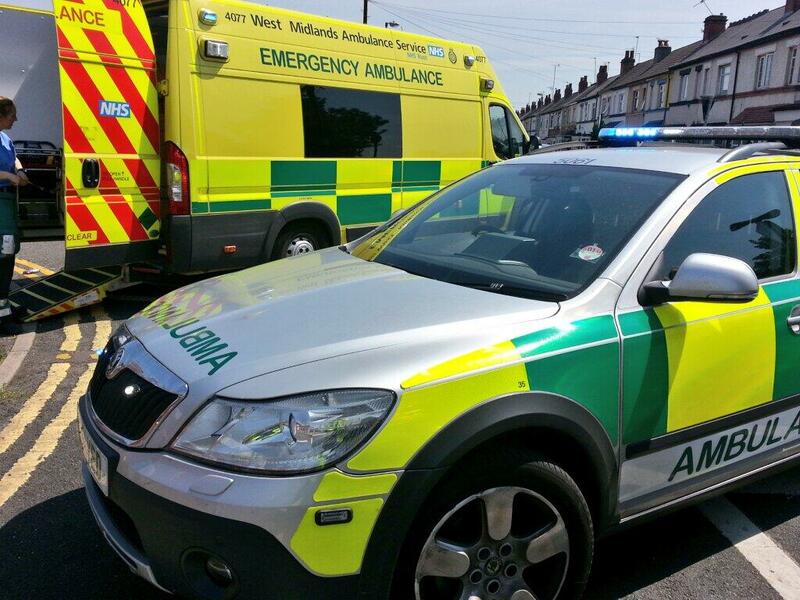 A girl has suffered a serious head injury in a collision with a car in Birmingham. West Midlands Ambulance Service was called to the junction of The Ridgeway and College Road, Erdington at 7.45pm yesterday (Tuesday). Two ambulance crews, a paramedic area support officer in a rapid response vehicle and the MERIT trauma team consisting of a trauma doctor and critical care paramedic attended. A West Midlands Ambulance Service spokesman said: “The girl suffered a serious head injury and was quickly taken on blue lights to Birmingham Children’s Hospital which had been put on alert. Tuesday 13th October 2015 – 8.15pm – Chris Kowalik. 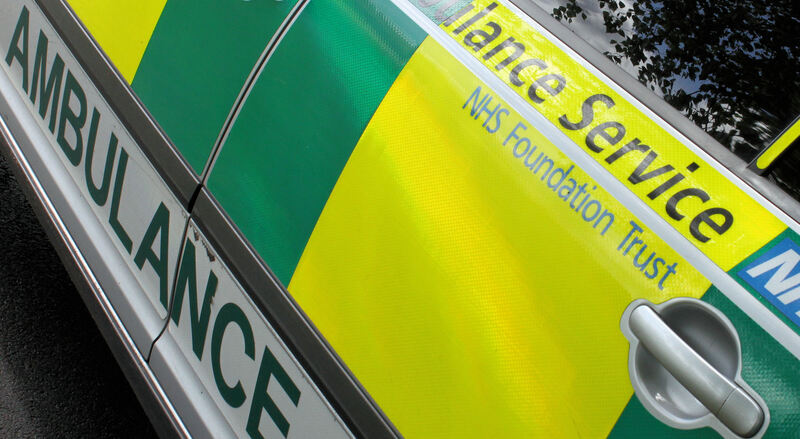 A motorcyclist has suffered a serious head injury after falling from his bike and colliding with a central reservation. 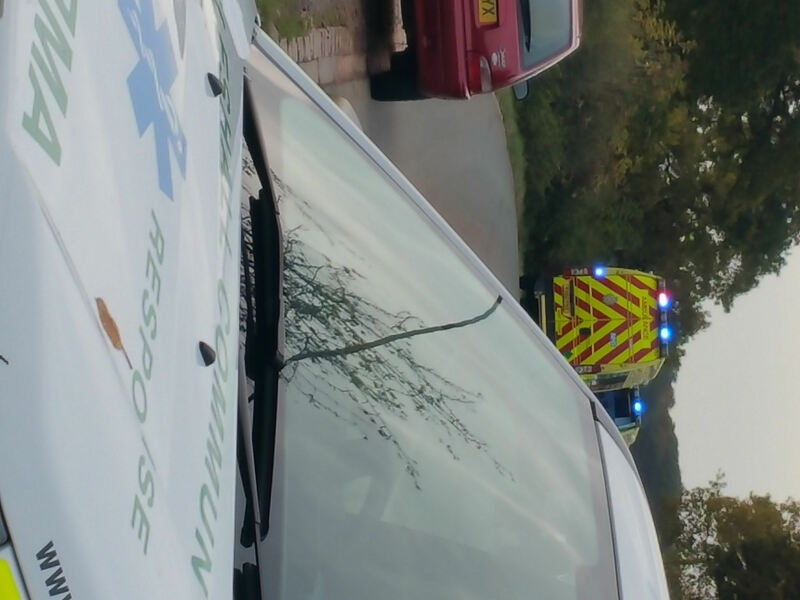 West Midlands Ambulance Service was called to School Lane, Exhall, Coventry, shortly after 5.45pm today. “The crew of the Warwickshire and Northamptonshire Air Ambulance attended by rapid response vehicle. Also attending were two ambulance crews and a paramedic area support officer in a rapid response vehicle. A West Midlands Ambulance Service spokesman said: “The man who is in his forties had a serious head injury, a chest injury and a suspected fractured pelvis.